A lot has happened since I last wrote, but every day comes with more things to do and I’ve unfortunately procrastinated on this blog. But it’s all good- I’ve been taking notes along the way. I’ve titled this Humankind v. Nature. Not to imply competition, but rather because the last 2 weeks have involved so much human intervention or human presence in such treasured areas, I can’t help to think about how humankind poses a positive or negative effect when dealing with different parts of nature and wildlife, as well as history. The last day of the course, two new interns came to the clinic and since then, we’ve all grown pretty close. That weekend, we had two amazing excursions on our days off. 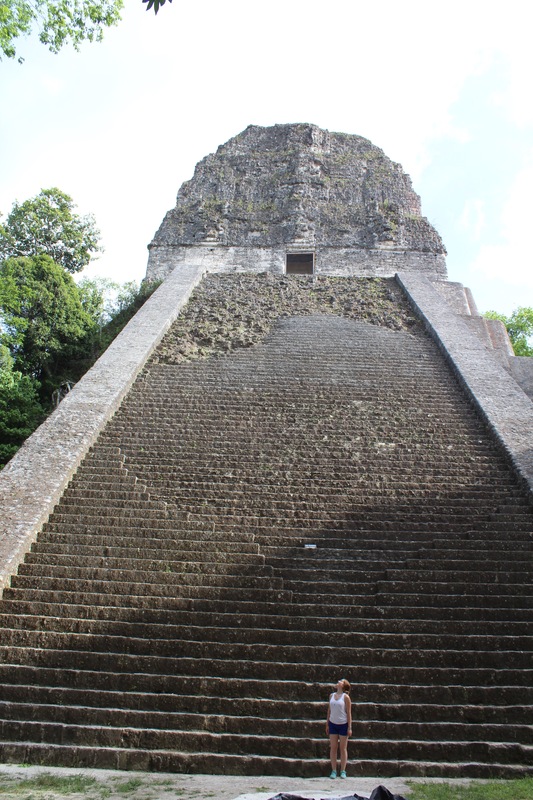 The first was to Xunantunich, Mayan ruins quite close to the town we’re staying in. 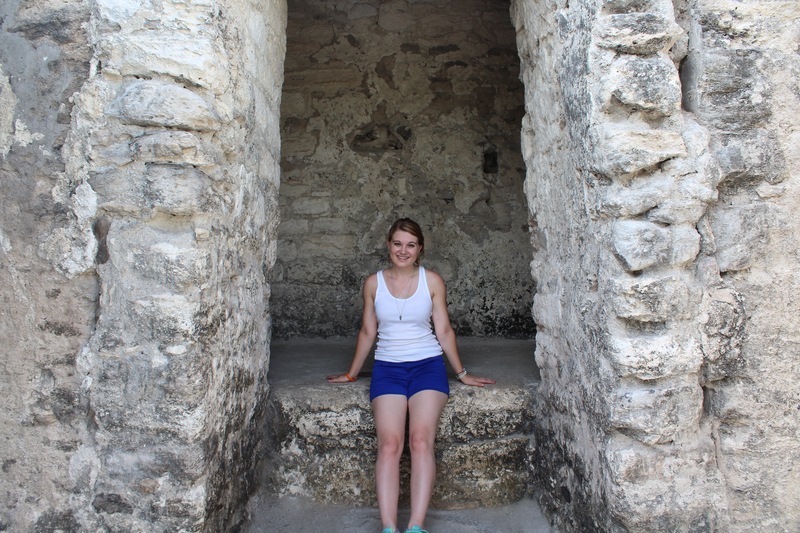 We spent about an hour and a half hanging around the ruins, specifically the top of the largest one on the property. 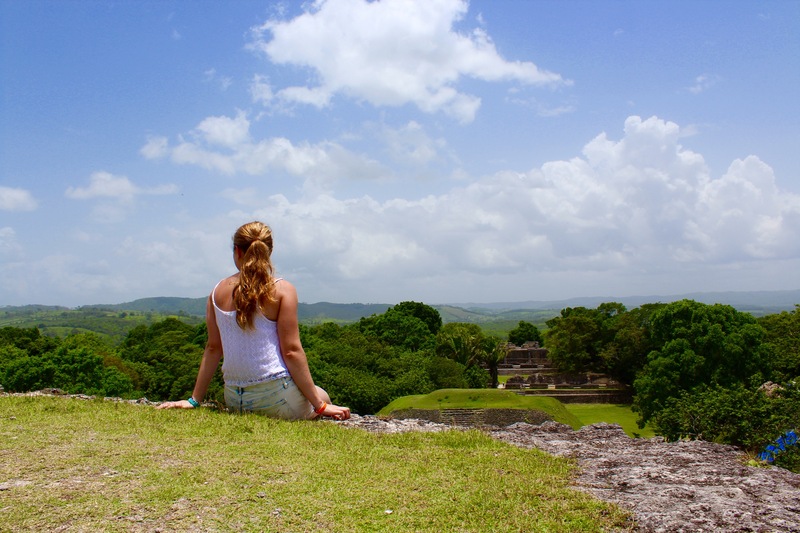 Incredibly, there was no one else at the top and we enjoyed the view on our own- just three girls and the sounds of the jungle, sitting upon an incredibly well-preserved artifact from as early as 600 AD. It was a beautiful place to sit. Our next excursion was to the ATM caves, short for Actun Tunichil Muknal. 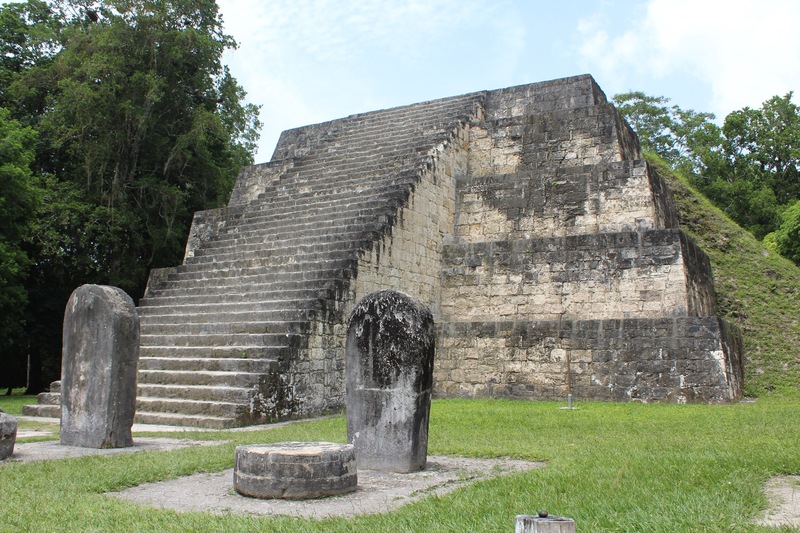 This is a Mayan archaeological site with skeletons, Mayan ceramics, and more artifacts strewn throughout the caves. Unfortunately, I have no pictures of the experience (and for those who know me well, you know how much this killed me) because cameras are banned in the caves. A tourist had accidentally dropped his camera on a skeleton many years ago and the skull of the skeleton shattered. So now they have no more of that. Which is heartbreaking. Anyway, we’ll have to rely on pure description. 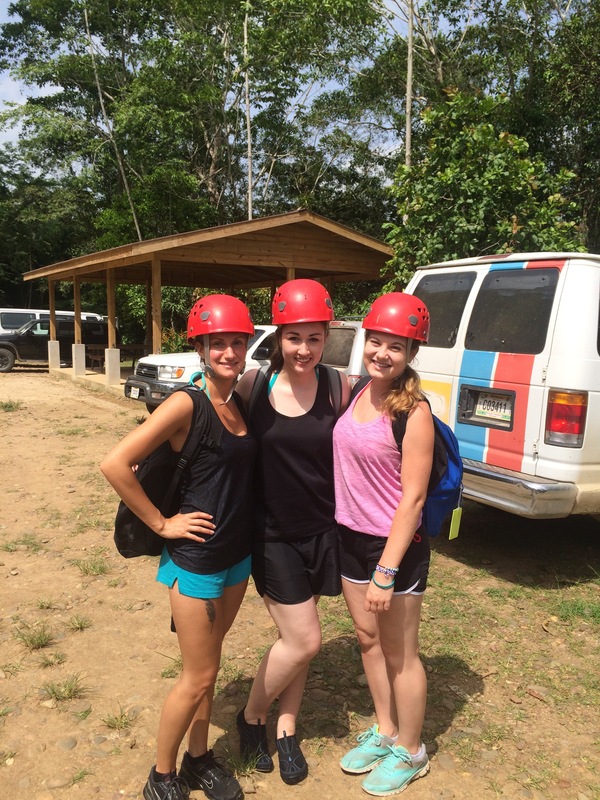 The experience began with a 45 minute hike through the jungle to get to the cave entrance. This involved not only hiking on land, but we had to cross three rivers as well. Without a bridge. 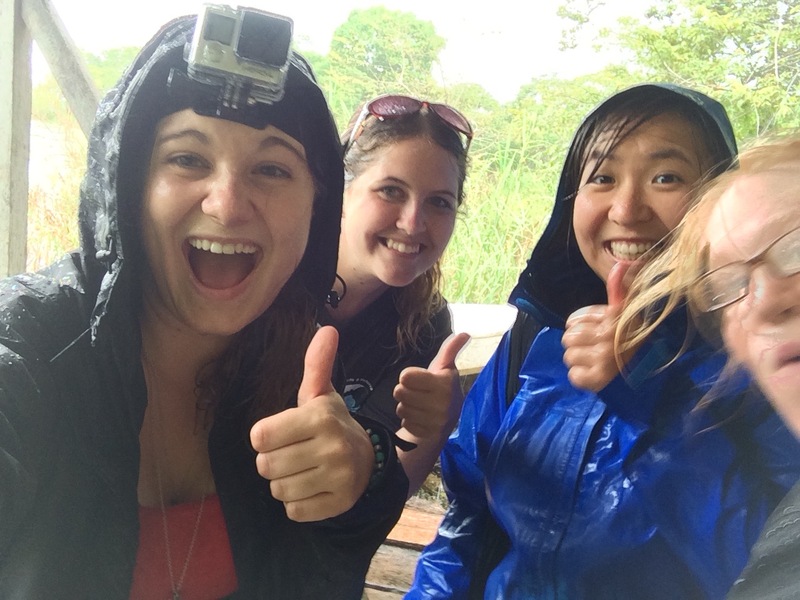 So we were soaked up to our stomachs within the first 5 minutes of the hike as we trekked through the river and neared the site. Courtney, Michelle, and I all agreed it was like we were real adventurers. Seriously awesome. When we reached the cave entrance, we put on our helmets complete with headlamps, and got into the water. The entrance to the cave was not over land, but into water and not just water to walk through, but about 15-20 ft deep water. We had to literally SWIM into this cave. The water was not cold but “refreshing” as our tour guide kept reminding us, and what we approached could not be captured in a photo even if I tried. The ceiling was dozens of feet above us and when we finally were able to stand, most of our legs were still submerged in water. Our time in the cave would total 3 hours, and for about 2-2.5 hours, we were walking in shallow water, trudging through deeper water, and literally swimming under and around rock formations. It was INCREDIBLE. Our tour guide taught us about the formation of the rocks around us and the different creatures that live in and around the cave while we trudged along. 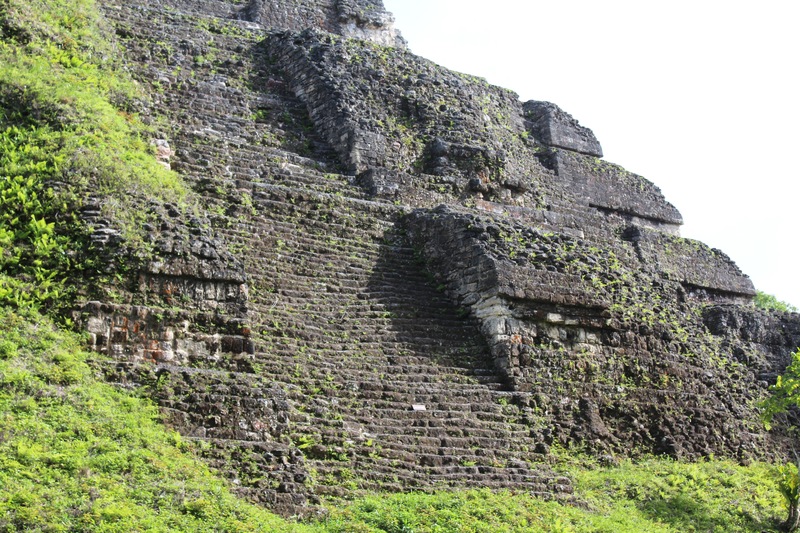 About 2 hours in, we reached dry land to climb and we were told to remove our shoes for the artifact portion of the tour. We walked around broken ceramic vases and bowls and complete or incomplete skeletal remains. This involved a lot of rock climbing into the roof of the cave (which seemed endless), a climb up a sketchy ladder at one point, and lots of careful treading around sharp rocks. About a half hour later, we made our way back into the water and walked/swam back to the entrance of the cave. Easily one of the most unique experiences of my life. 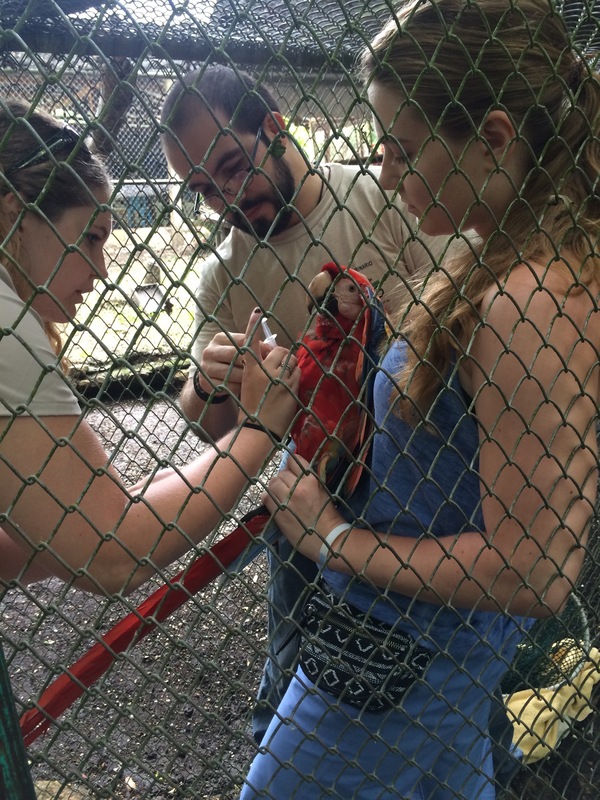 Last week, Courtney, Michelle, and I were invited by Dr. Isabelle to go with her to Chiquibul National Park to work with some macaws preparing to be released. It was about a 3 hour trip with 100 miles of unpaved road, but we got to see some beautiful sights along the way. Mountain Pine Ridge Forest Reserve was one such site we passed through which interestingly was pine forest – a drastic change from the tropical forest we’ve been in. 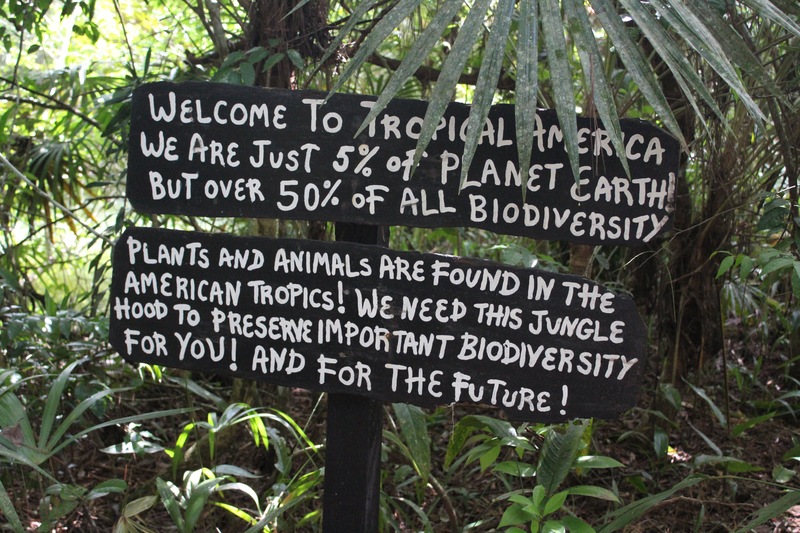 Quickly, though, the forest seemingly morphed back into the tropical forest when we reached Chiquibul. Wild birds of all sorts, flying around the buildings, surrounded our accommodations and big cat sightings have been recorded in the area during the nighttime. When we got ready for bed, our lights went out and the dark black of nighttime quickly enveloped us. I can honestly say I don’t think I’ve ever experienced such darkness. 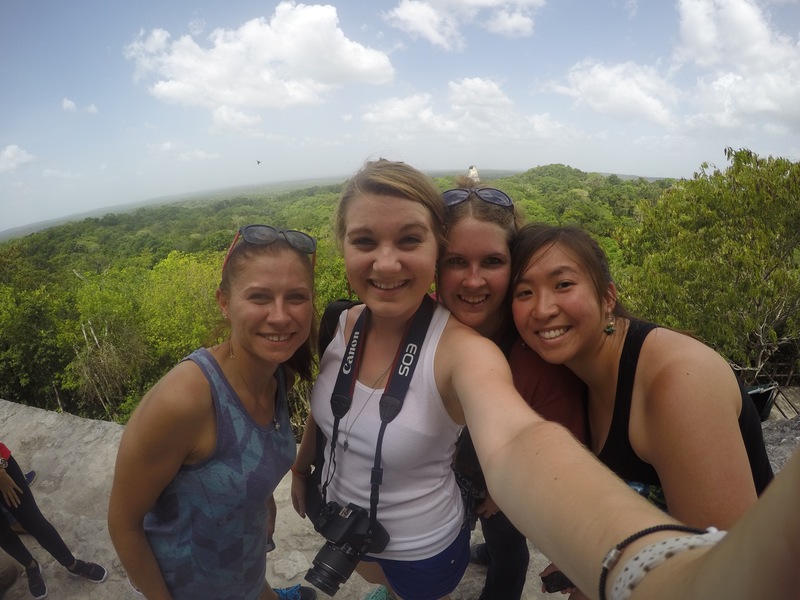 The sounds of jungle, bugs, birds, and wildlife were vivacious and all encompassing. Rain began pouring down on our roof and drowned out the wildlife that we shared our house with. Cooler than any old camping trip, that’s for sure. 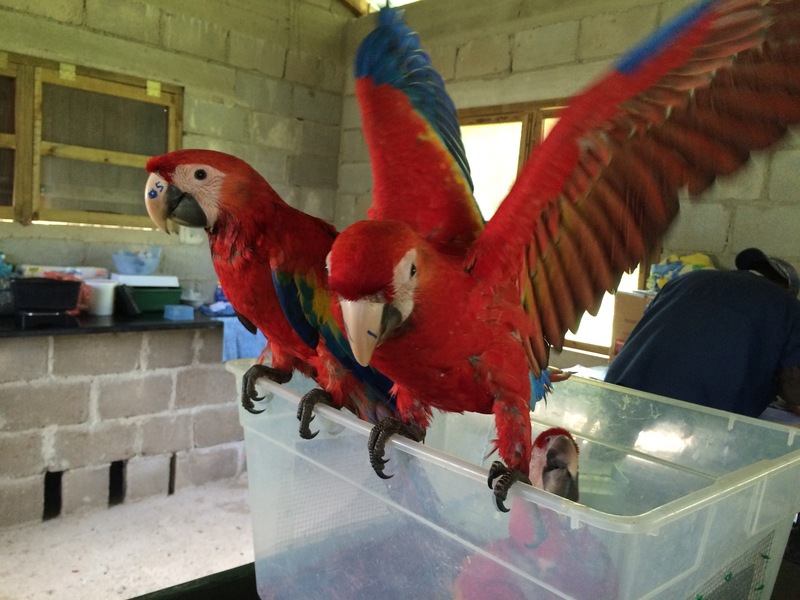 The following morning, we had an early rise to get started on the handful of macaws we would be working with. 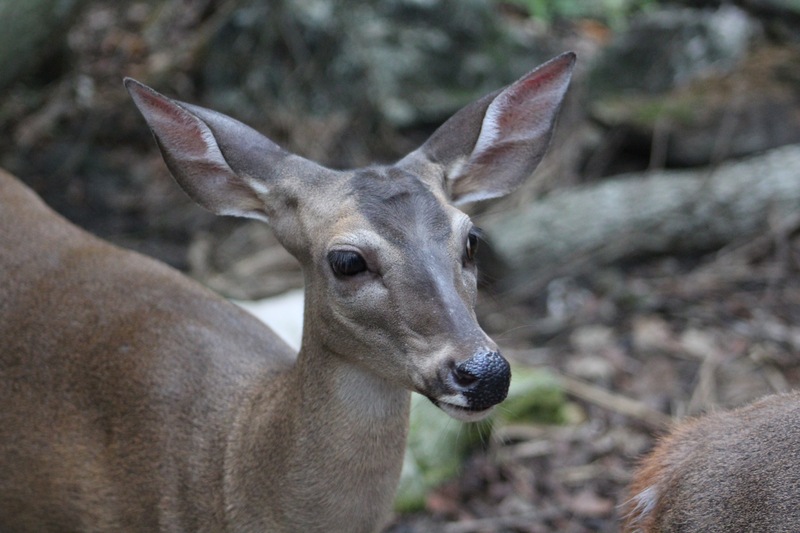 Poaching is one of the largest problems in wildlife, especially in Belize. 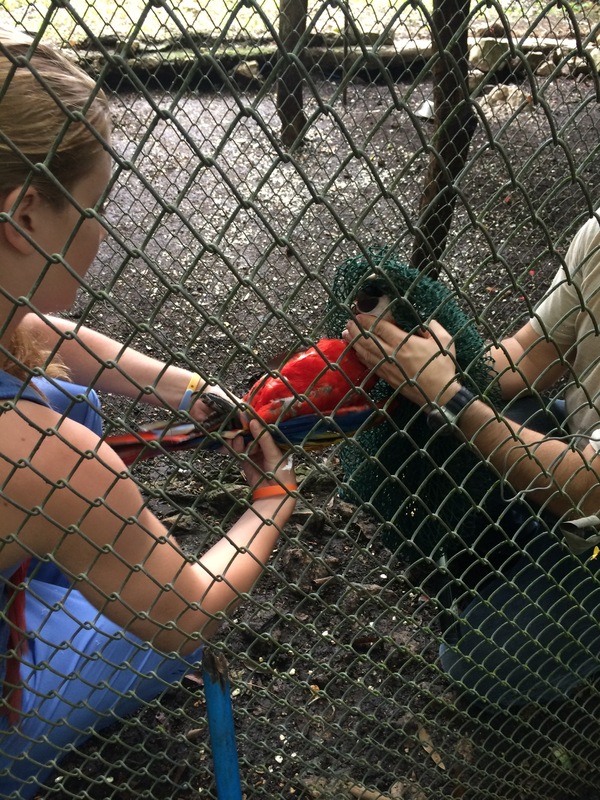 Guatemalans cross the border and rob nests of young scarlet macaws to feed into the pet trade. 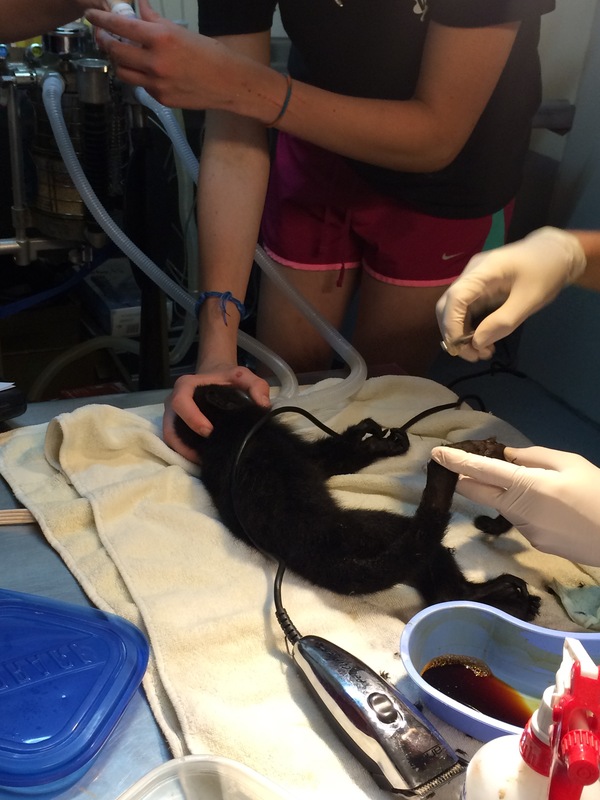 Our job involved a general overview of their health and a microchip injection to prepare them for release. We left shortly after the job was finished, and one of the most incredible sights greeted us on the way back. 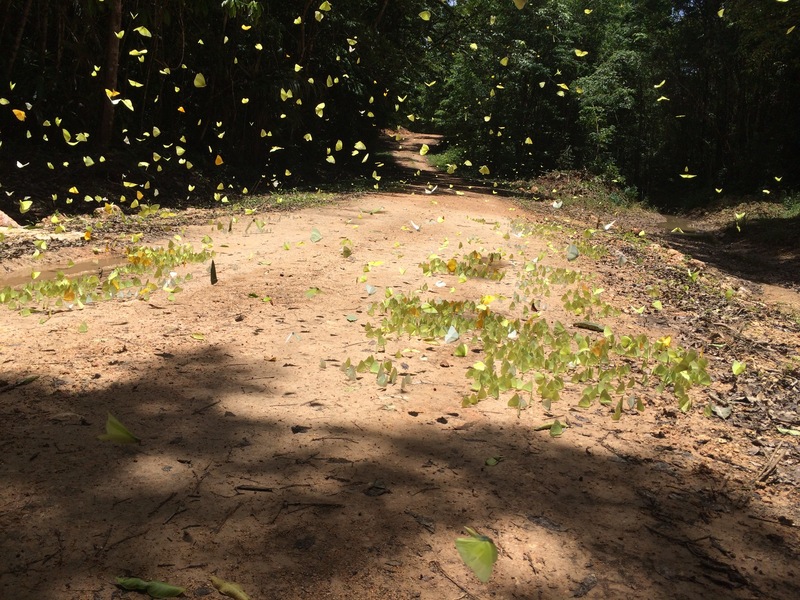 We dubbed it “Butterfly Highway,” as there were easily hundreds of butterflies that lined the road we would be taking. We got out of the car for closer looks and walked through. 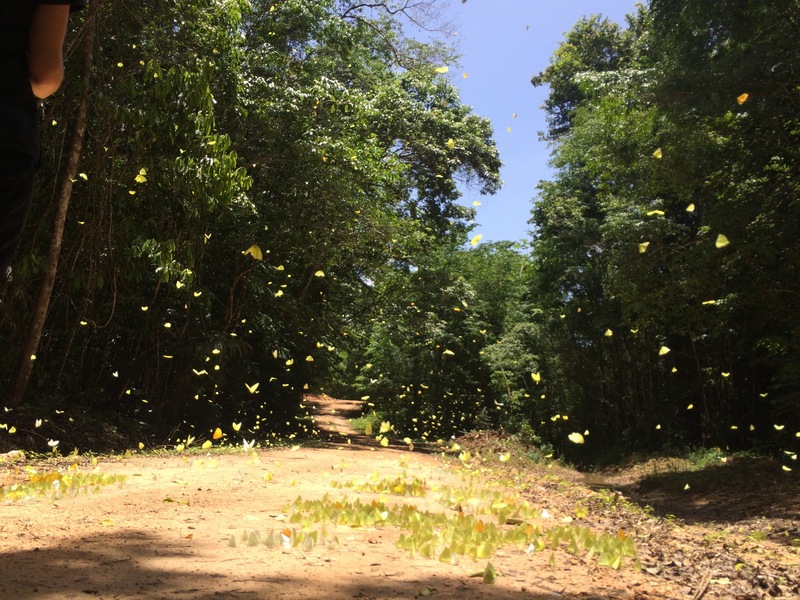 Responding to our presence, the butterflies all began flying up and around the place we stood until we were literally engulfed in a bubble of butterflies. It was a crystal clear representation of wild beauty in its natural form surrounding humanity and we were mesmerized (the photo doesn’t do it justice). Since then, the interns and I have been working at the clinic. We’ve seen a good amount of cats and dogs, tended to the wildlife that is currently housed in the back, and assisted in more procedures. 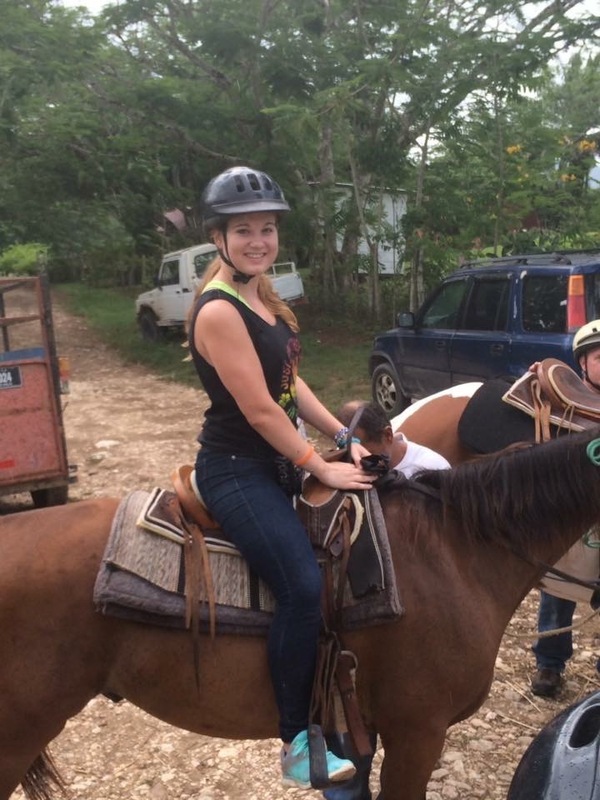 We also used this last weekend to go horseback riding in the rain (in a rainforest – how fitting) and spend the day at a pool in Cahal Peche resort – who says we can’t have some relaxation on the side? 😉 We also checked out a casino in the area as well as a few places to meet locals. These are my last 3 days in the clinic and then it’s back to the airport for me. I’m looking forward to spending my last days here, but I know I’ll miss it desperately when I go. 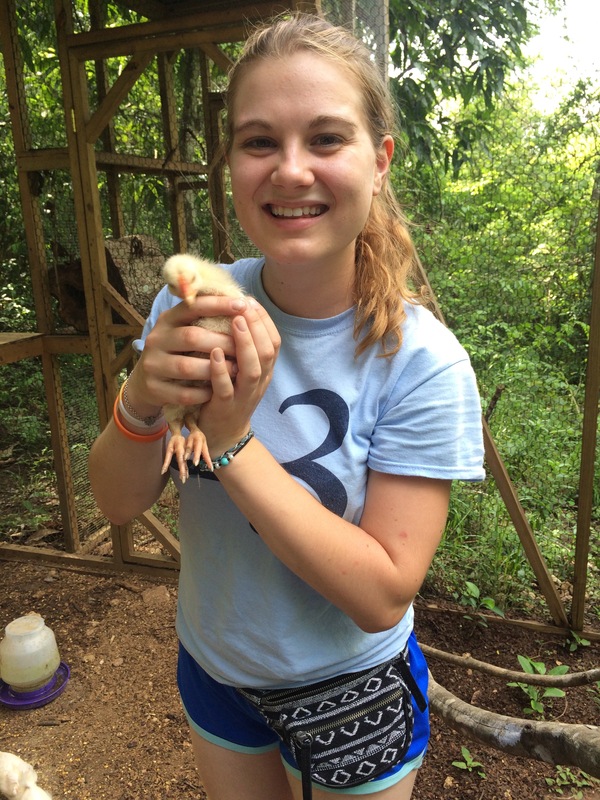 The clinic, animals, and environment, along with the people who have been so good to me here. The last few days of the course went by way too quickly. We did our last batch of wildlife visits, the first being Community Baboon Sanctuary. 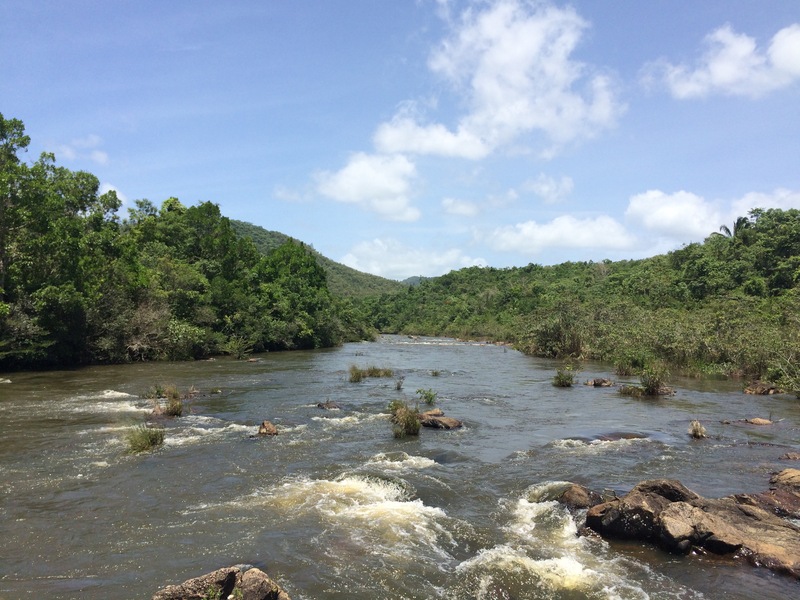 This is a strip of land along the river where a certain amount of people in the community essentially agreed to share their backyard with nature and monkeys. 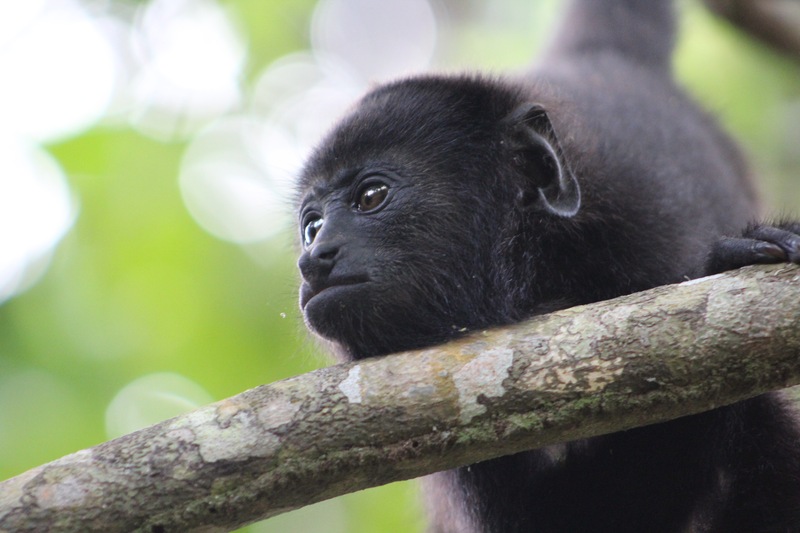 Our tour guide gave us a wonderful overview of the awesome plants growing there (plants with medicinal properties for swelling, wounds, fevers, pregnancy testing, etc) and we got to come face to face with a howler monkey troupe, including a baby howler monkey inches away from our faces! 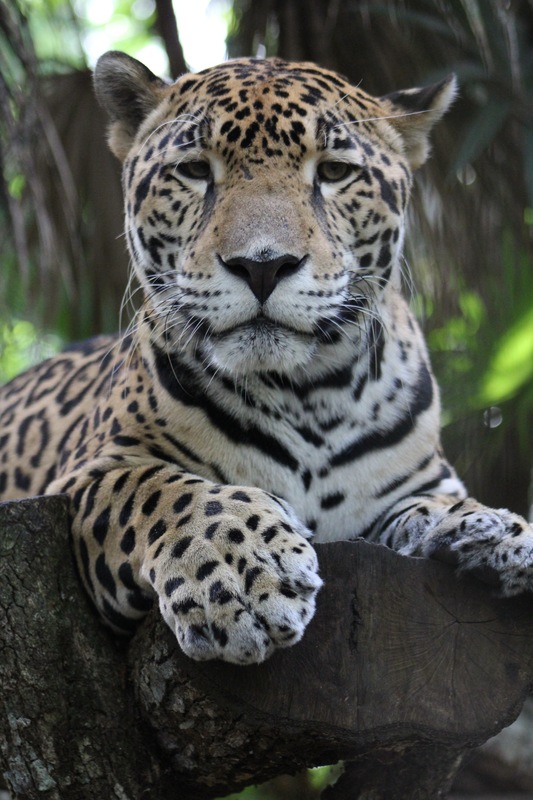 The same day, we visited the Belize Zoo. 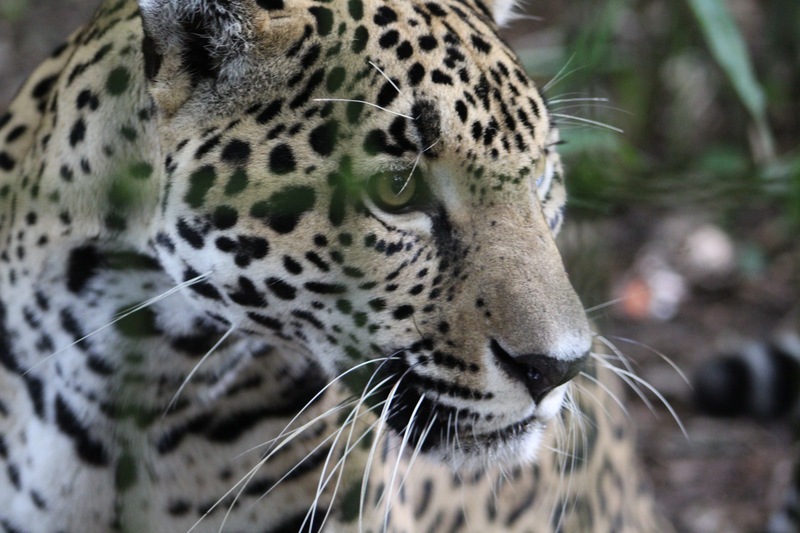 This one is filled only with native animals, like tapirs, crocodiles, jaguars, coatis, ocelots, and the like. 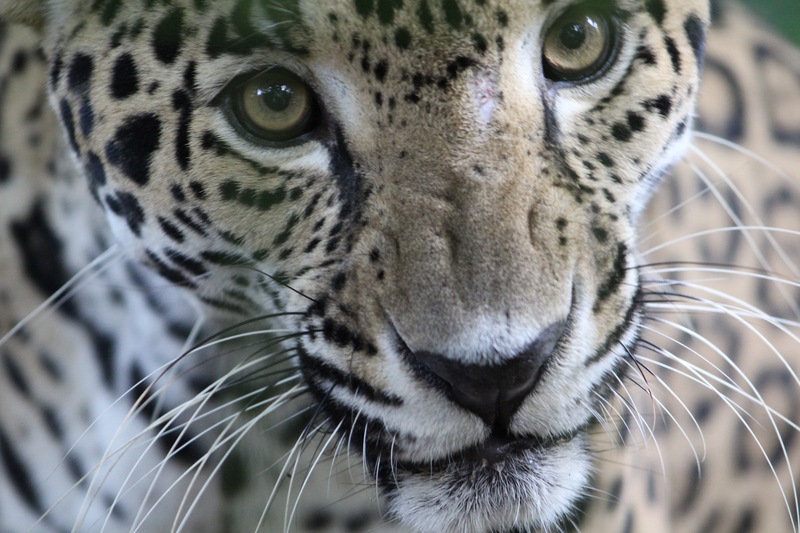 I got a fair amount of photos of the animals very close up, and we had the amazing opportunity to get in a cage within Junior Buddy’s cage – oh, yeah, Junior Buddy is a jaguar. We got to feel his paws and watch him get fed within inches of our faces. So COOL! 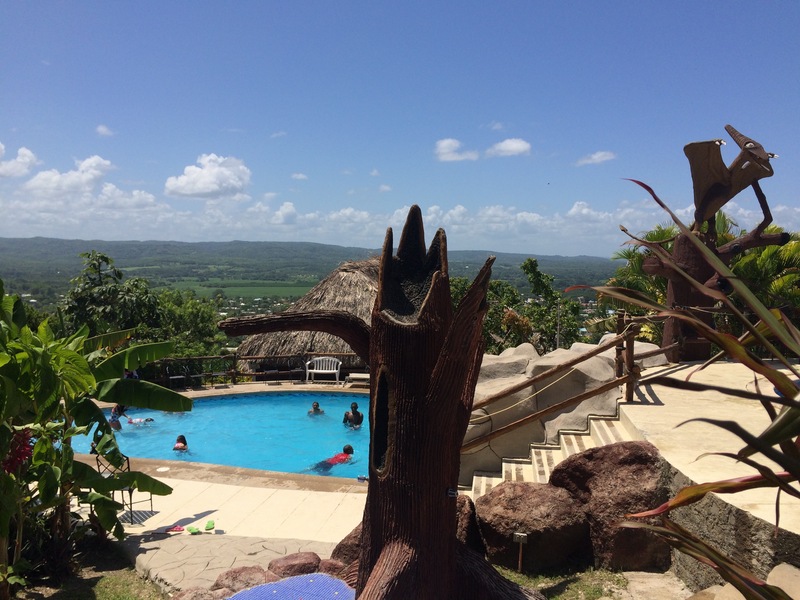 Another day, we visited a belizean Bird Rescue, owned by a British woman who moved to Belize for retirement but ended up taking in injured parrots and raptors. There were dozens and dozens of parrots, both releasable and non-releasable, as well as some beautiful raptors like a Harpy Eagle and the most beautiful owl I have ever seen. Our last two days in the clinic were bittersweet. I knew I’d be coming back in a few days, but it was the last stretch for the rest of the group. We helped with feeding and cleaning in the mornings, and later on we got to practice our suturing on some chicken (dead already, no worries). 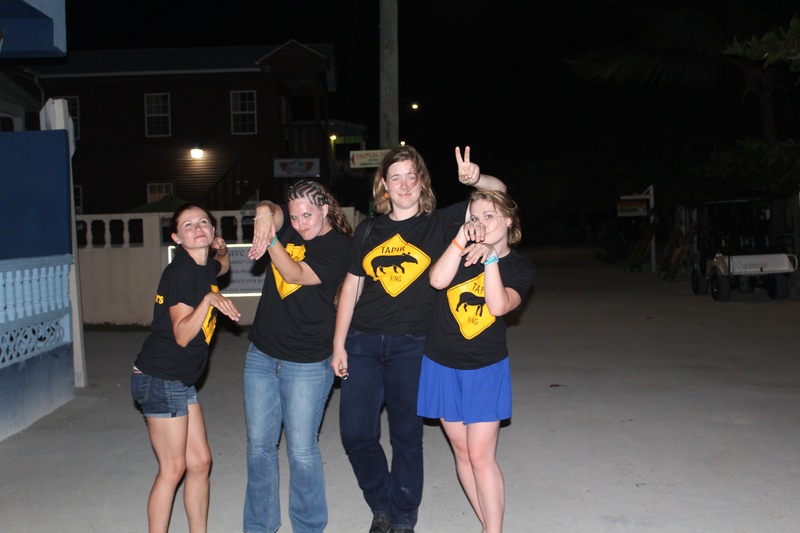 We were allowed to watch and assist in tamandua and turtle necropsies. We also learned how to load medication in a blow dart gun as well as how to shoot it at a target. 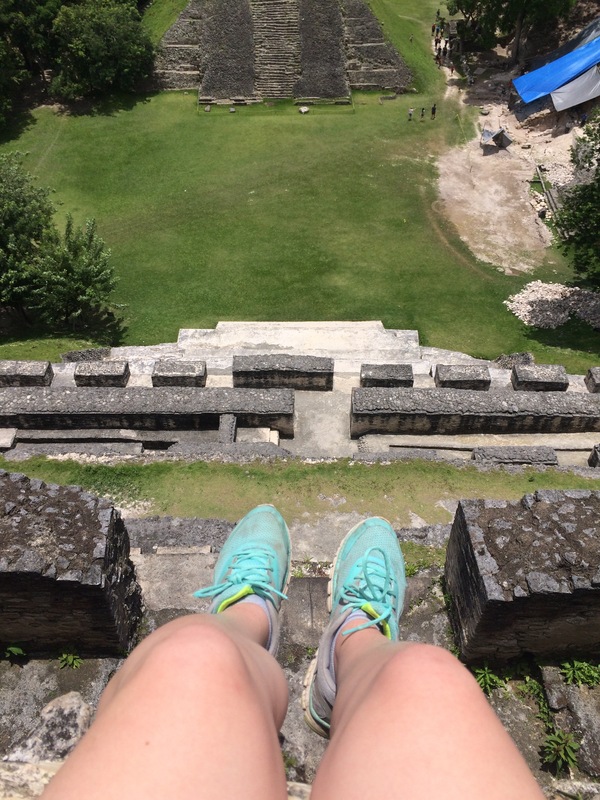 It was pretty cool – and it definitely isn’t as easy as it looks. 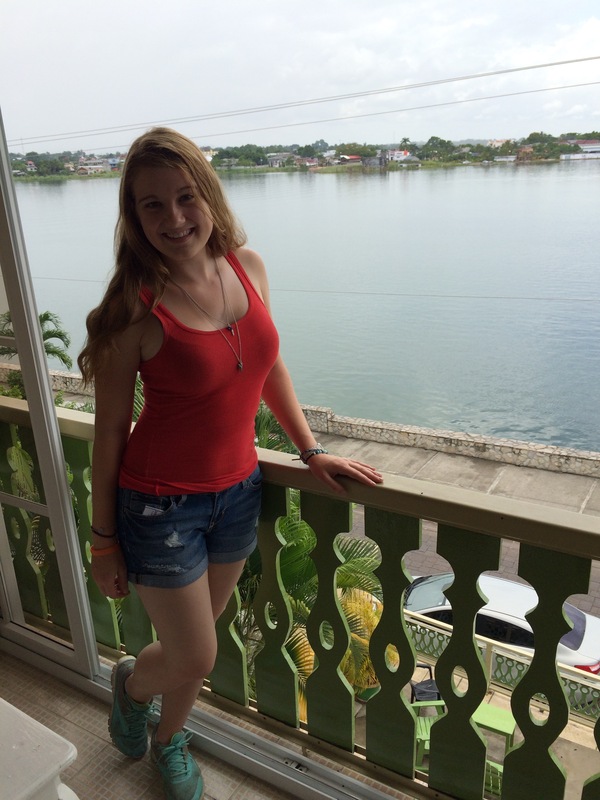 Our last day was a day of travel to Belize City. 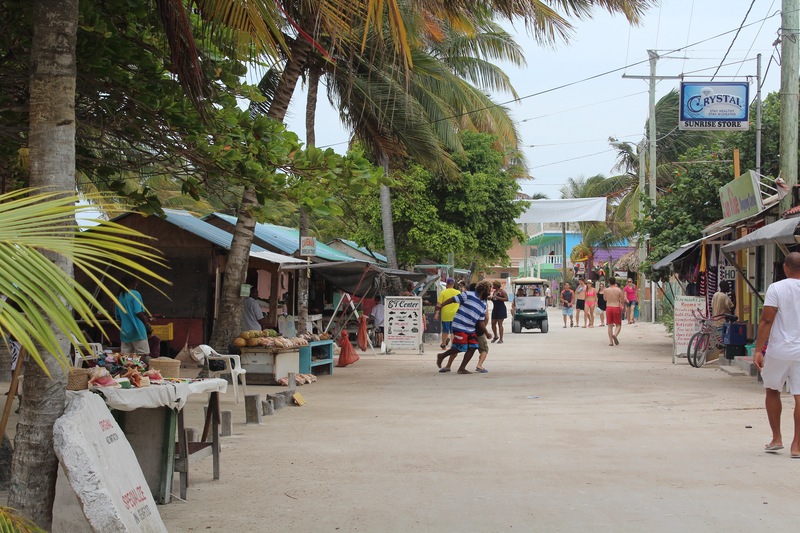 We would be spending the day and night on Caye Caulker, an Island off the coast of Belize. 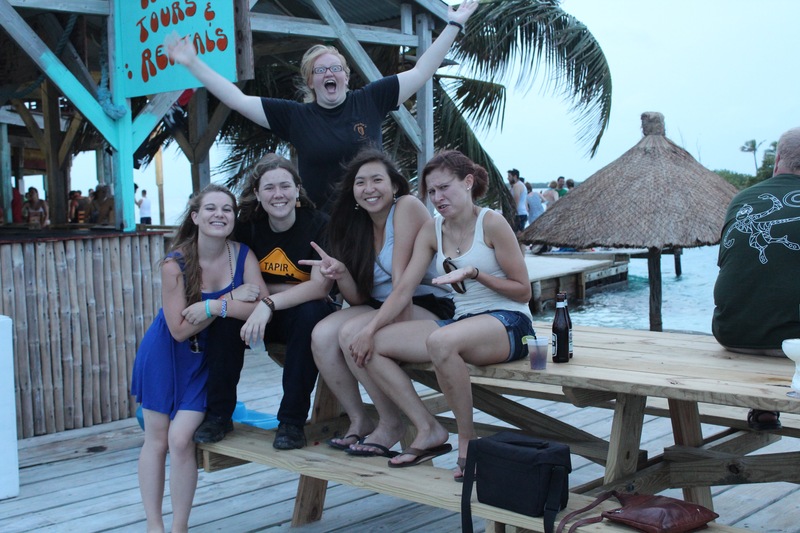 A water taxi took us across the water in 45 minutes to the lovely Caye. I don’t know exactly what I was expecting, but it exceeded anything I had imagined. It was touristy, but not TOO touristy, we walked on sand to our hotel, there were palm trees everywhere and little shacks with souvenirs lining the streets. Our hotel was even cooler. In addition to a huge room, our balconies had hammocks. …HAMMOCKS!! 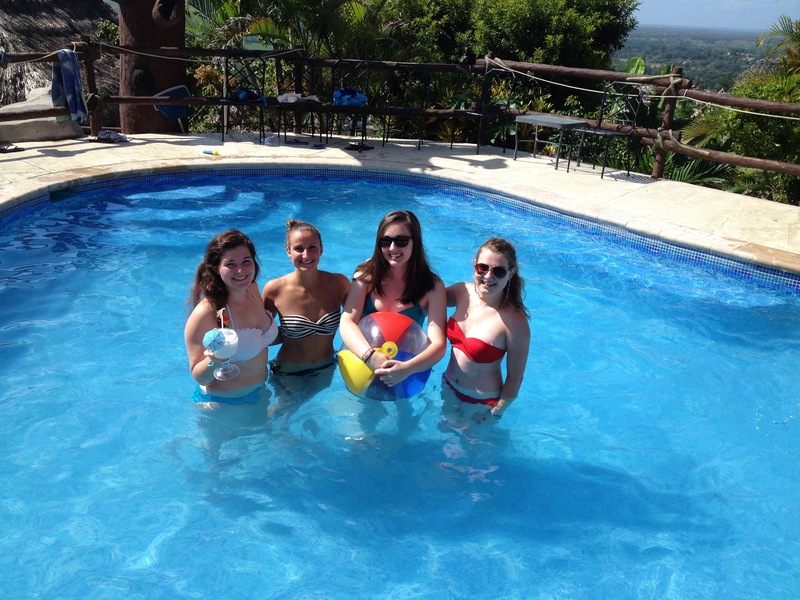 We spent the next 3 hours snorkeling in three different locations in the ocean. Each had its own unique coral/wildlife. 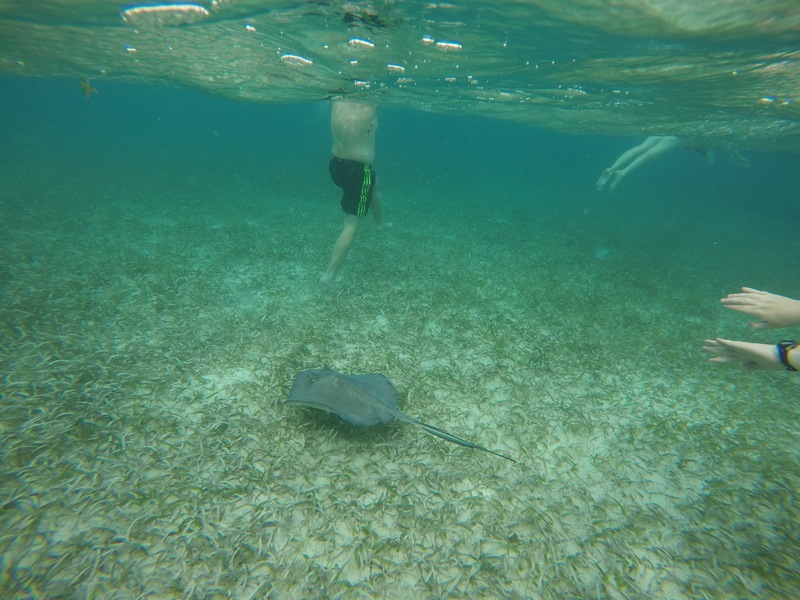 The first was mostly corals and fish, the second had stingrays and sharks, and more coral in the last. 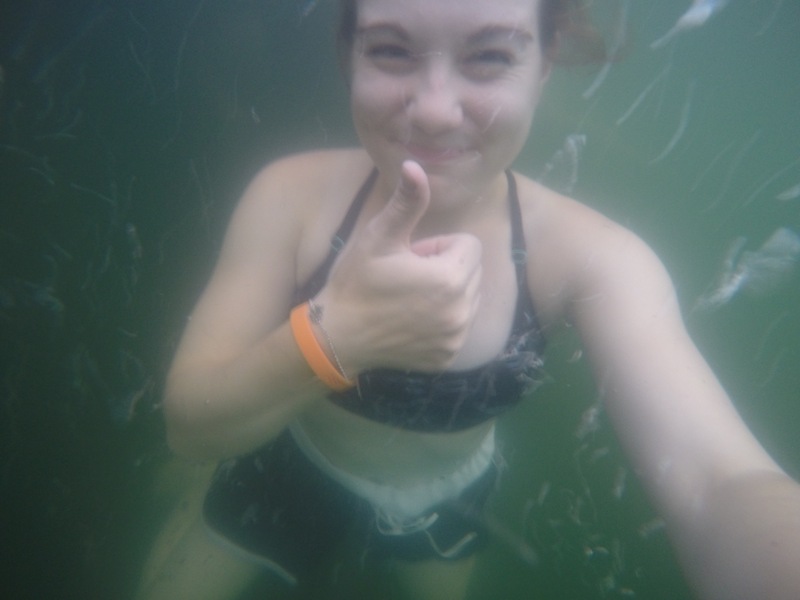 My snorkel was being stupid, though, and kept breaking, so I ended up with a ton of salt water in my eyes, nose, and mouth. If it weren’t for that, the activity would have been perfect. 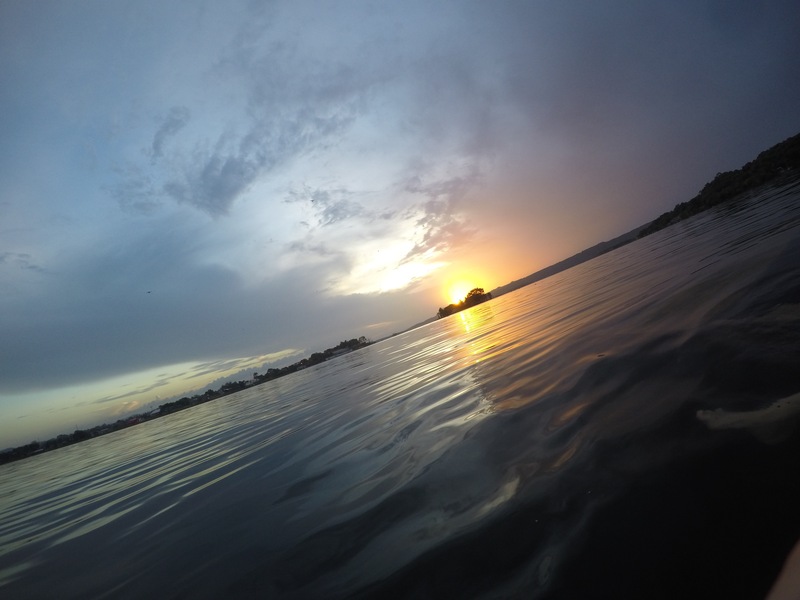 I had my GoPro strapped on my forehead and got to enjoy the feeling of being on water (when I wasn’t choking to death). There really is such a beautiful world down in the water. The next morning was a quick goodbye to each other and to the island that had quickly stolen my heart. And sitting on the boat back to Belize City, we spotted a dolphin beautifully cutting through the ocean water with its fin, and I couldn’t help but smile. This is what I travel for. The marvel of it all. The immensity of the ocean, the world. There is so much out there beyond our own lives, our own countries and hometowns, our own histories. There are great memories to be made, fascinating people to meet, unbelievable stories to create and share with our future children. All of this is just a culmination of feelings that few things can match. 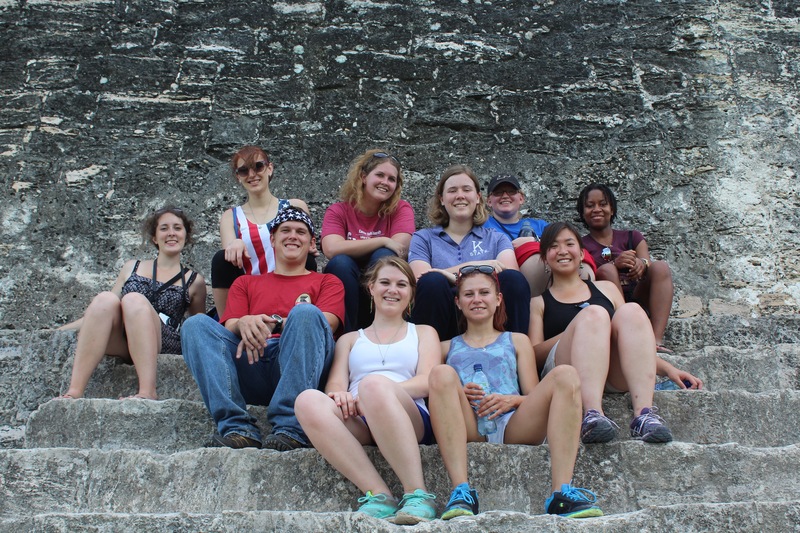 The group went to Guatemala to visit another rehabilitation center this last weekend. We woke up pretty early to get to the border and meet Justin on the other side, and it was actually pretty amusing to walk across the border. 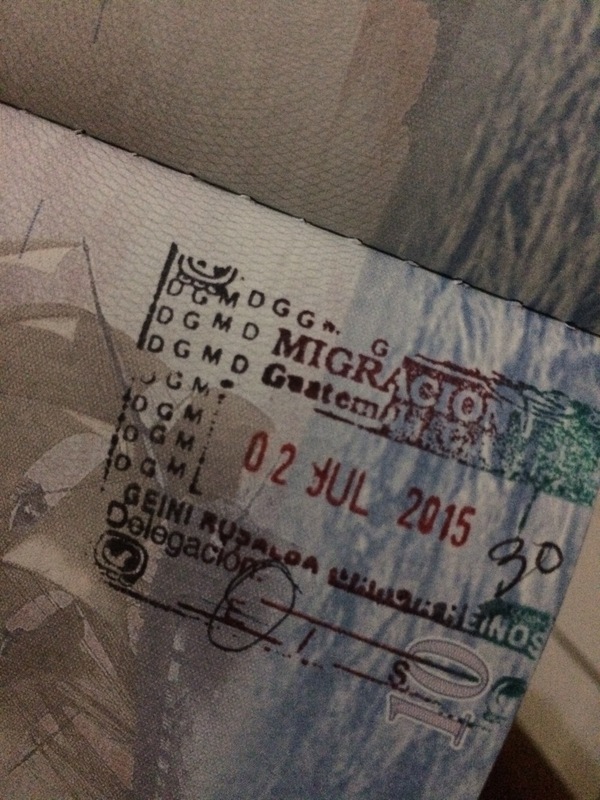 There was of course regular immigration to get through, but something about walking into another country is funny. 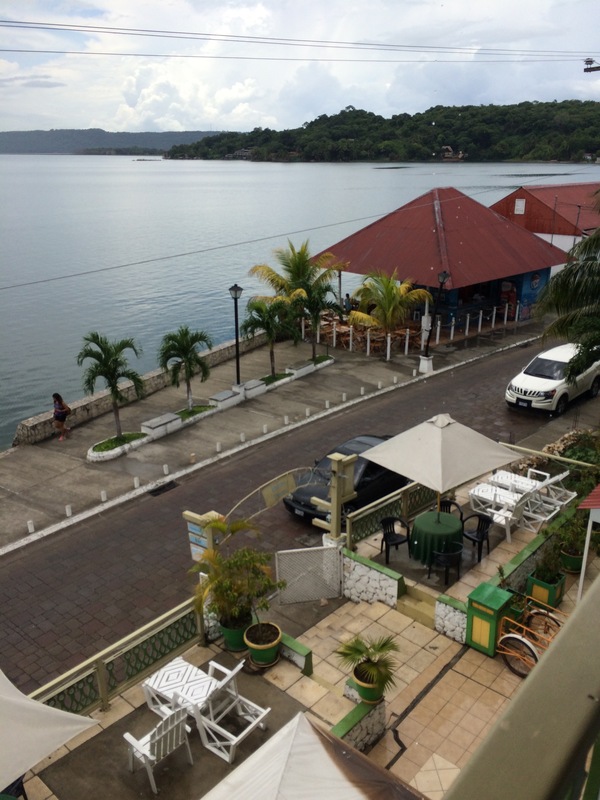 We were staying on an island called Isla de las Flores. 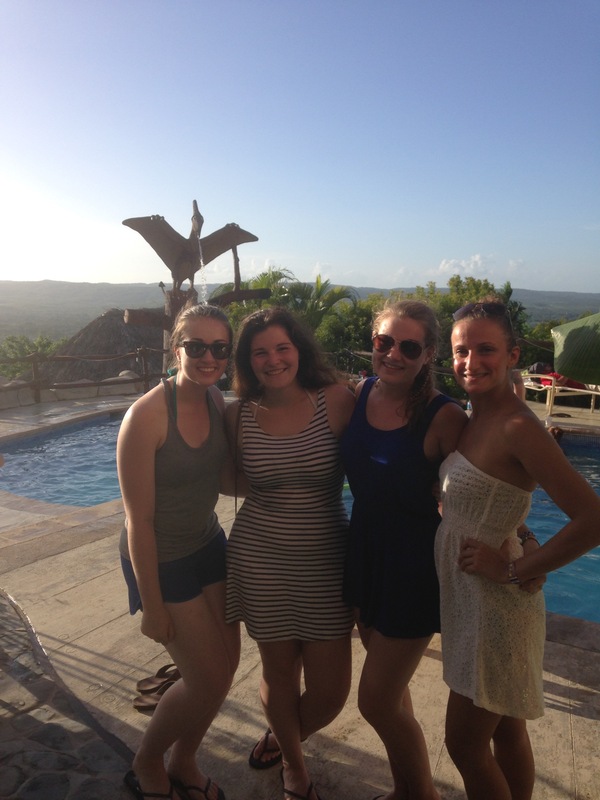 We all fell in love with the Island pretty quickly. Our hotel was right on the dock to get into the lake and it had a huge pool right in the middle of the lobby. Our balconies came with the view of the lake and surrounding islands. It was really a beautiful place to be staying, even if it was for 3 days. 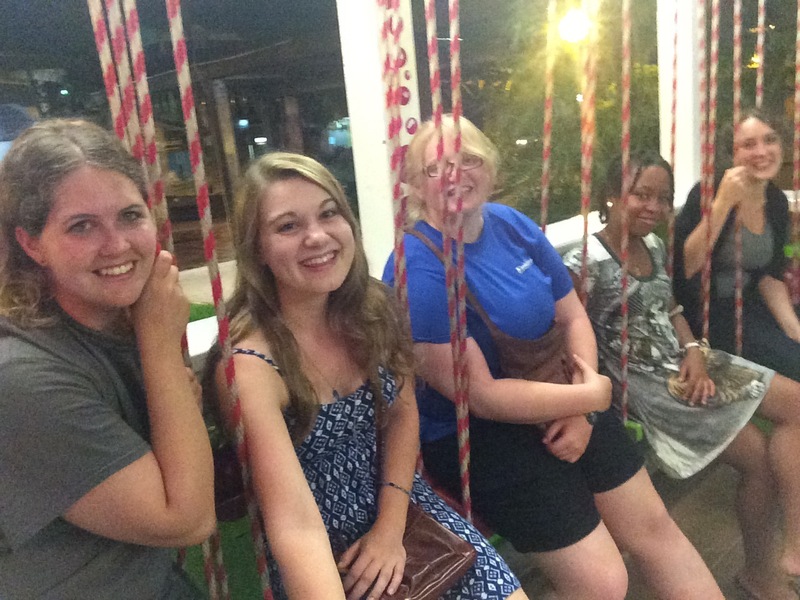 A few of us needed to go to the mall for some basic supplies, so we took what is called a tuc tuc (probably misspelled that, but meh). It’s basically a step down from a golf cart, but so much fun to ride through regular traffic. 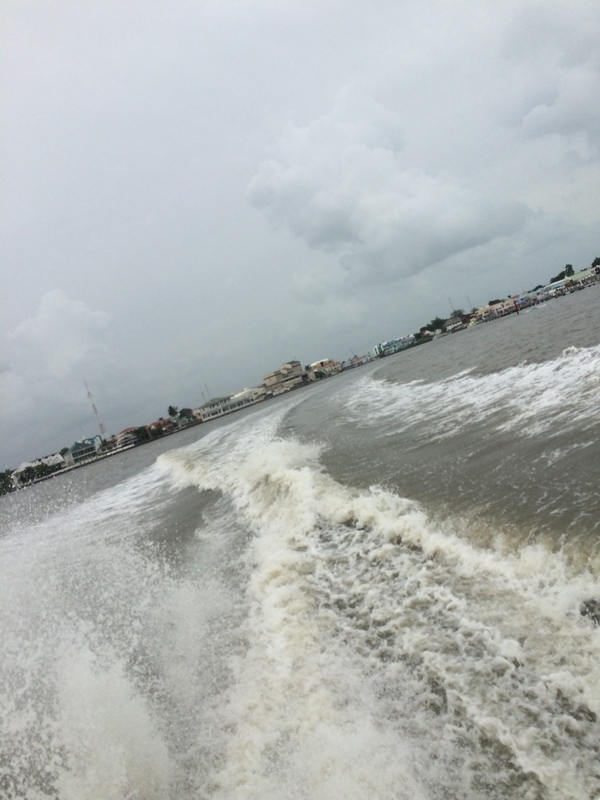 After eating lunch on the island, we took another small boat out to ARCAS (the rehab center). A storm was very clearly looming close by, and we ended up floating right into the eye of it. Toward the end, it started to downpour on us. 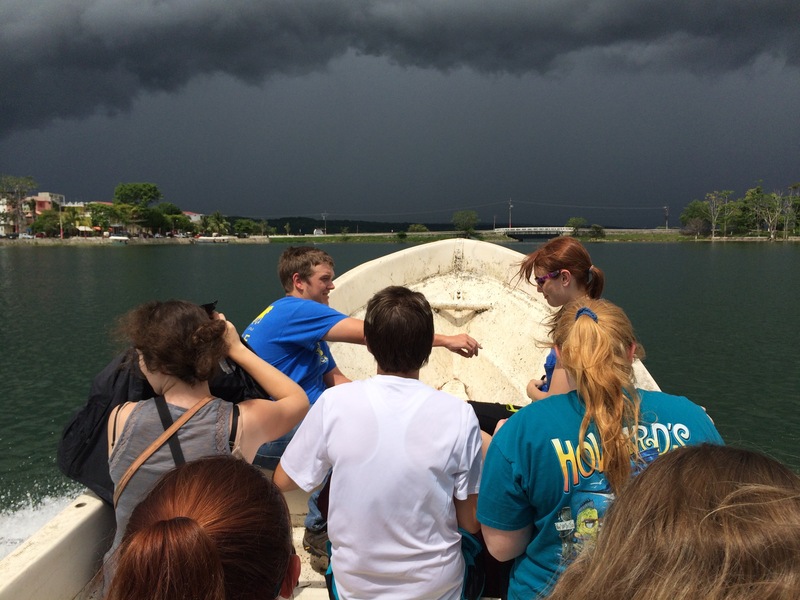 We got out of this boat absolutely soaked before running for cover in part of the center. Thankfully it calmed down enough to get a tour of the facilities. They’re pretty impressive, both in size and regulations. 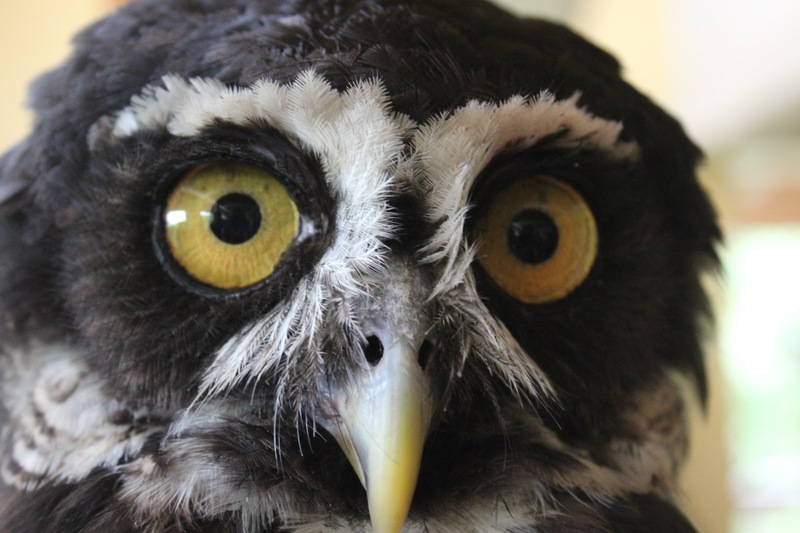 Animals that come in for rehab go through a pretty long process before being anywhere near ready for release. They start with initial intake and slowly work their way up into bigger and more independent enclosures, as they grow stronger. There is very little human interaction unless it is necessary. I really appreciated these protocols. 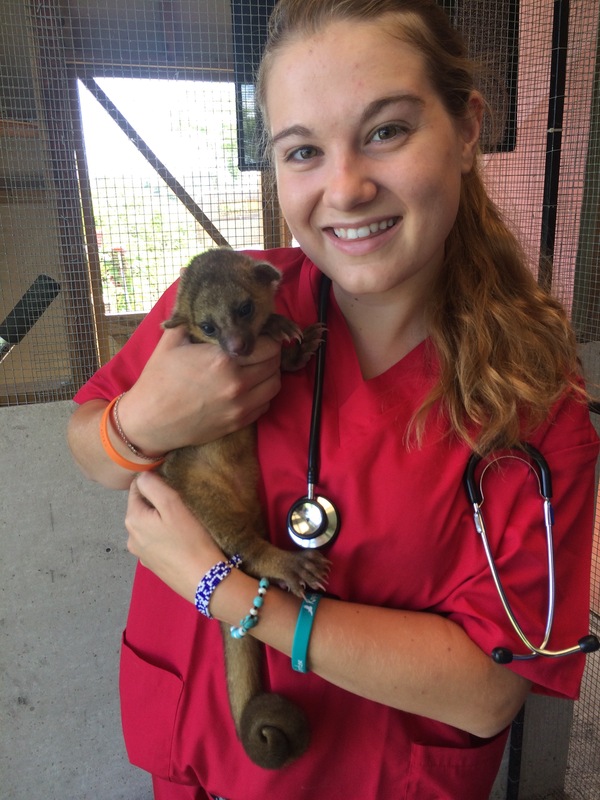 It felt very disconnected, and in wildlife rehabilitation I’ve learned that’s very important. This first day, we just toured the facilities and had a lecture about conservation in wildlife centers. The next day would be filled with more hands on activities. 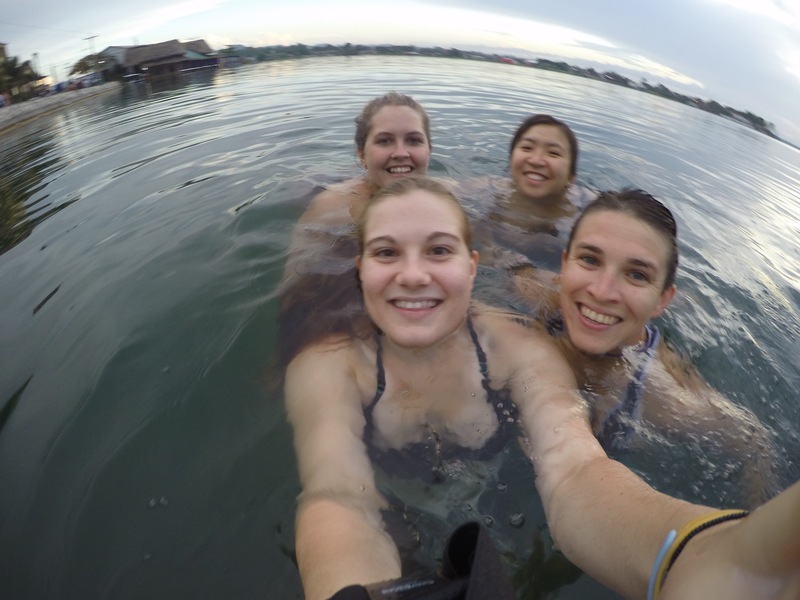 Later in the evening, we took a swim in the lake (which was amazing after the scorching sun came out again). The next day at ARCAS we were going to be working with scarlet macaws. These beautiful birds are not endangered generally, but they are endangered in Belize specifically. Ths is unfortunately due to the illegal pet trade. 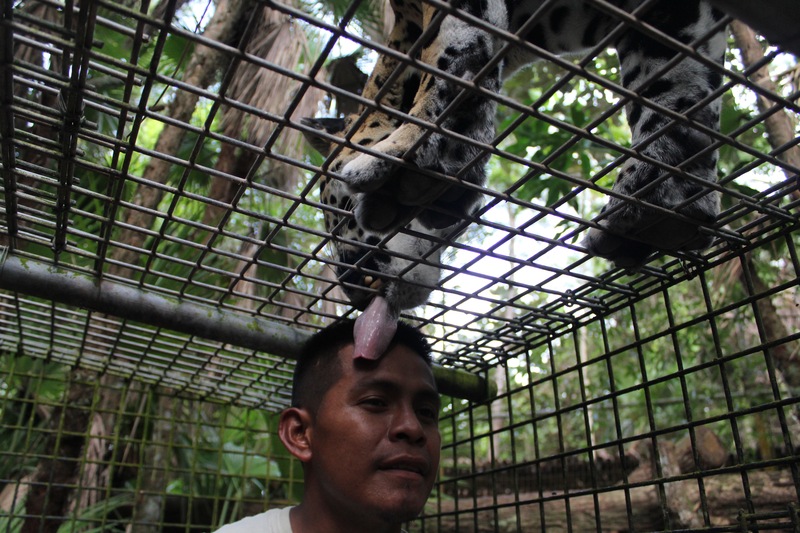 Many people from Guatemala go into Belize to capture these birds from the wild and bring them back to sell as pets. They are miserable in homes, especially without any form of enrichment. Before we even got to hold them, the pain of their bite was emphasized to us. It was enough to make everyone pretty nervous about holding one. It seemed to be similar to penguin handling (restrain the head and contain the bottom of the body) but their beaks do look sharper. Our hands would shake and we would just be dripping sweat (the humidity didn’t help of course). When it came to my turn, I had to capture one with a net. Then I held onto the bird as my partner put flea powder on its wings while the vet looked for other parasites. 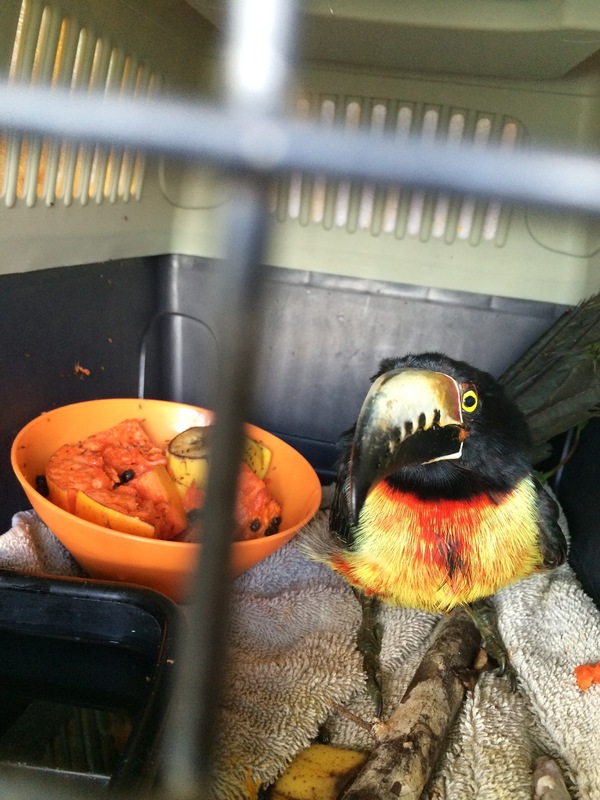 The bird was given oral medications and injected with more medications too. When we were finished, we switched and I got to do the medications while my partner held. It wasn’t as bad as it originally sounded; we just needed a strong grip. I guess it’s better to be more careful than less, though. 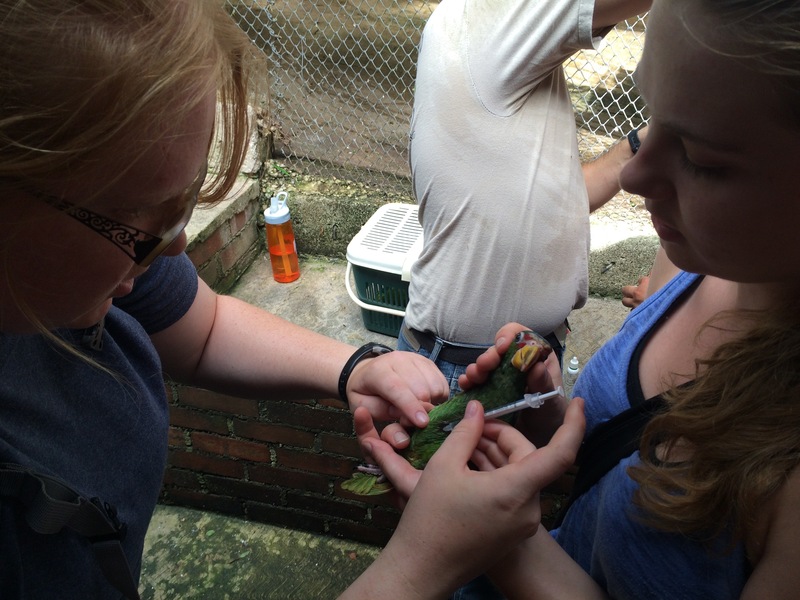 After lunch, we medicated the baby macaws as well. Their bites didn’t hurt at all, so that was a relief. 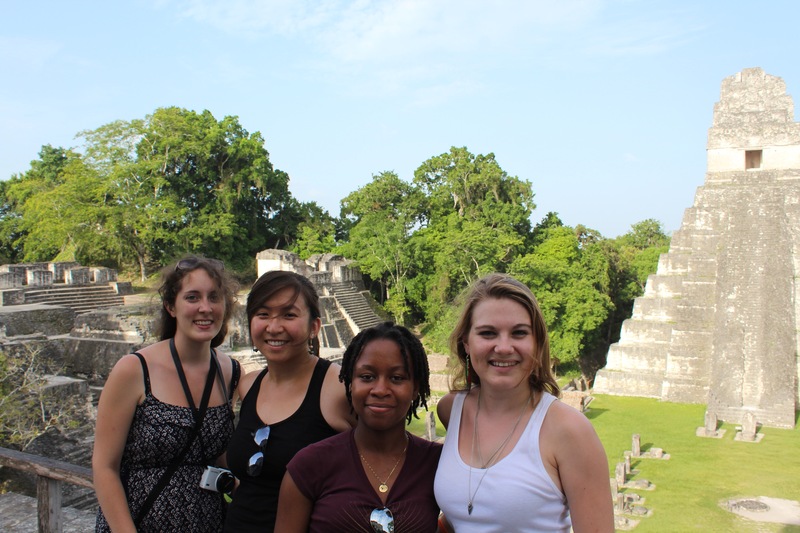 Our last day in Guatemala (the fourth of July) was spent at Tikal, a famous site of Mayan ruins. It was absolutely breathtaking. 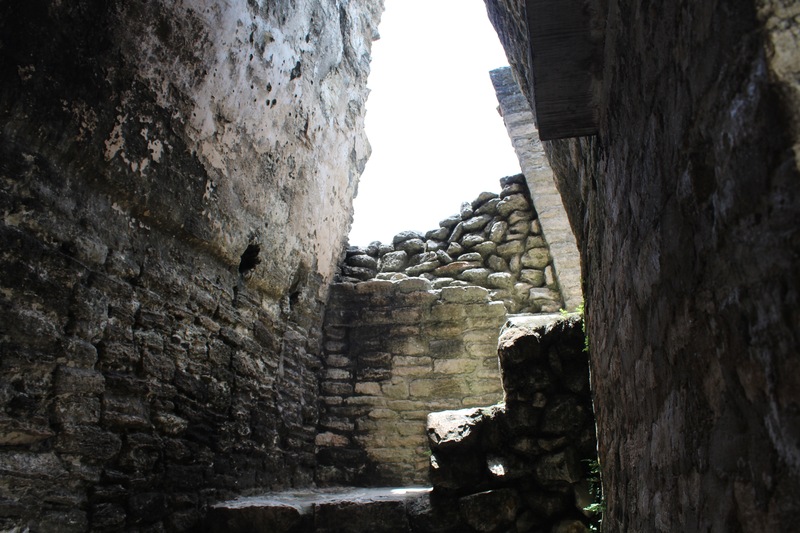 We got to hike up most of the ruins (except for those that people had fallen off of and died… makes sense) and learned about a lot of Mayan history. I think pictures are better than words in this case, so I’ll just leave it there. 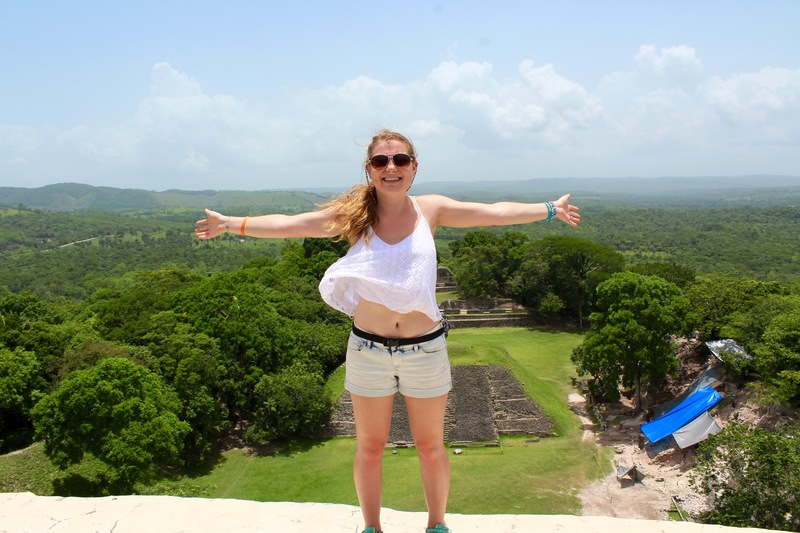 A huge smile was already plastered on my face when we started to fly over Belize and I saw an endless amount of green. 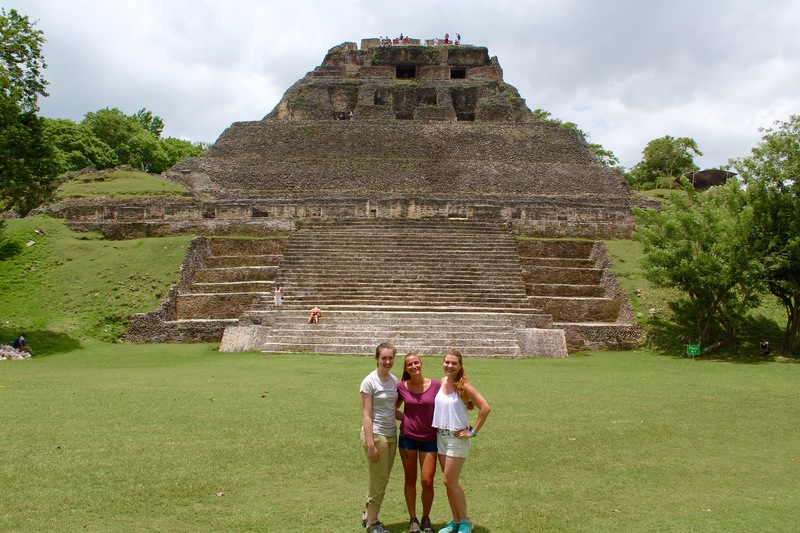 I got off the plane only to wait some longer in the Belize immigration line where I met two people who would be in my program! 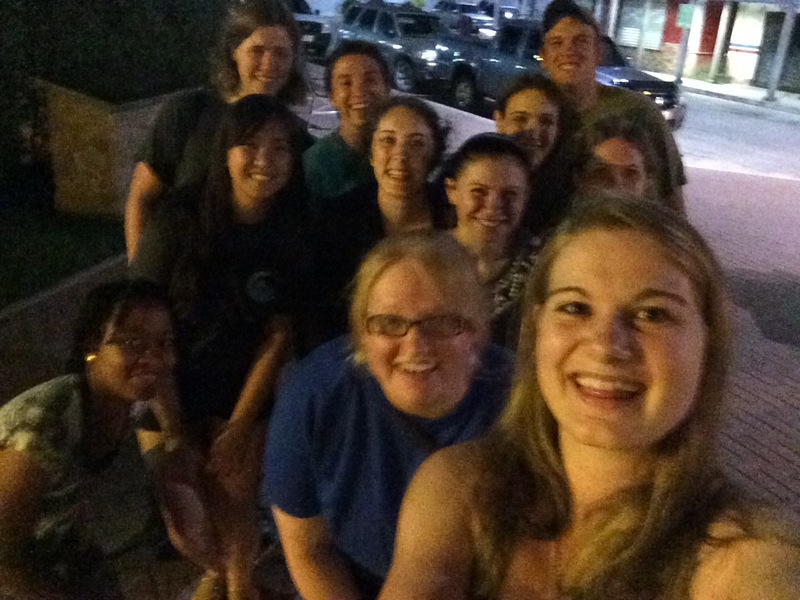 When we made it out of the airport, there was our driver, Mike, and some more students. Our group is composed of all vet students plus one undergrad (me) and as intimidating as that felt at first, I’ve already grown to love these people. A majority is from Kansas State, some from Virginia-Maryland, a couple from a French vet school, and one from Purdue. 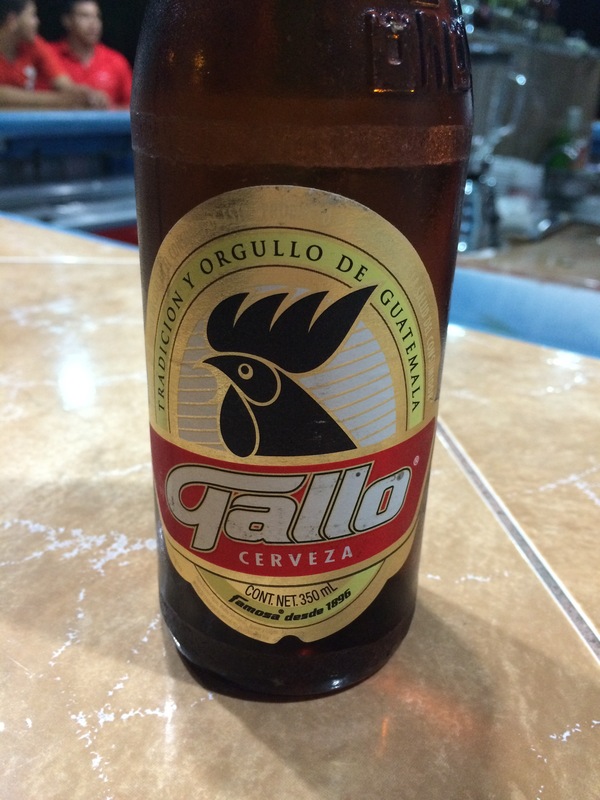 We crammed into a van on our way to San Ignacio, near the Guatemalan border, and stopped along the way at a restaurant whose style has been characteristic here – outside, but covered by a roof. 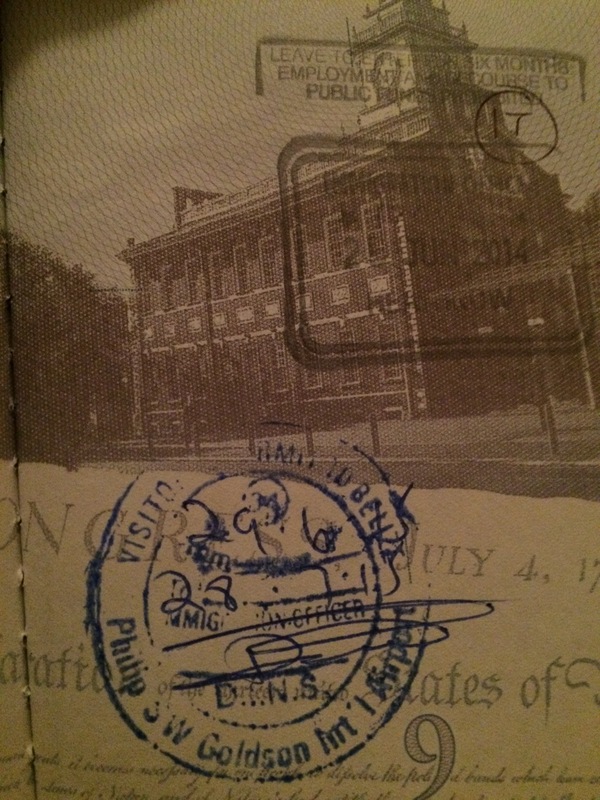 We have yet to go to an indoor, AC restaurant – which is not a bad thing at all, just very different to the states. 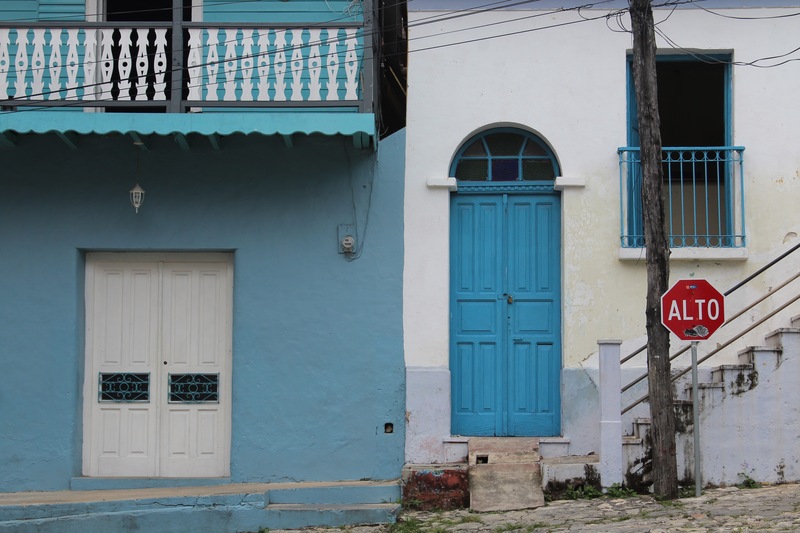 After our first meal in Belize, we were back on our way to our accommodations. I was so impressed with them. We’re staying on a property that includes a few different buildings, so we all stay a little dispersed in the rooms. 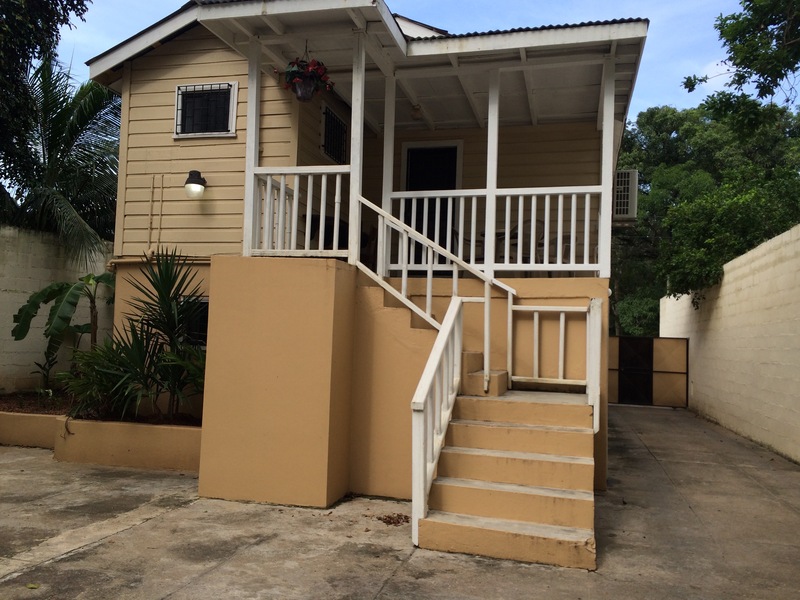 This had used to be a bar called the Snooty Fox, then the Fox Club, and now just Sam and Shelly’s house. They have 2 wonderful dogs and one that likes to pretend she lives there, which really makes it feel homey. We have a group of canoes, kayaks, and tubes for our use on the river as well, which is right behind the house. 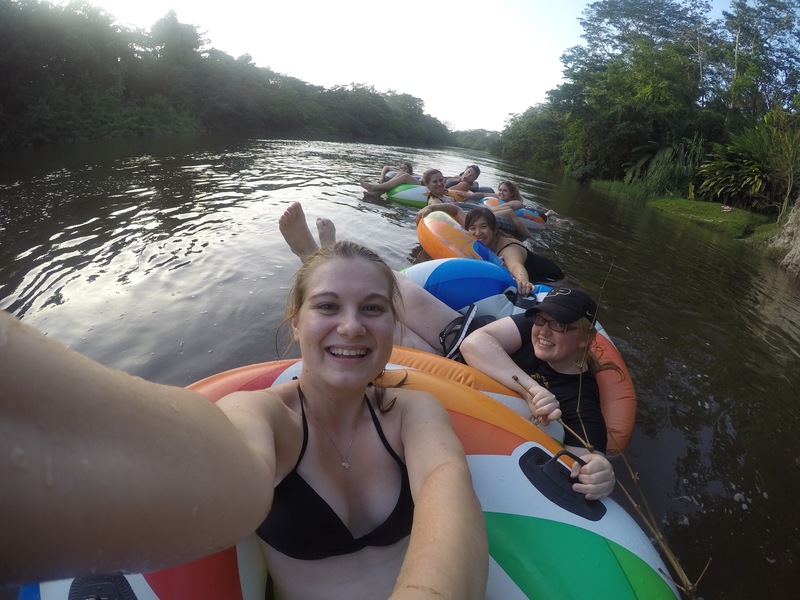 Already, we’ve taken tubes out there and hung onto branches to keep us from floating away with the current. It’s a wonderful way to end a long, hot day. 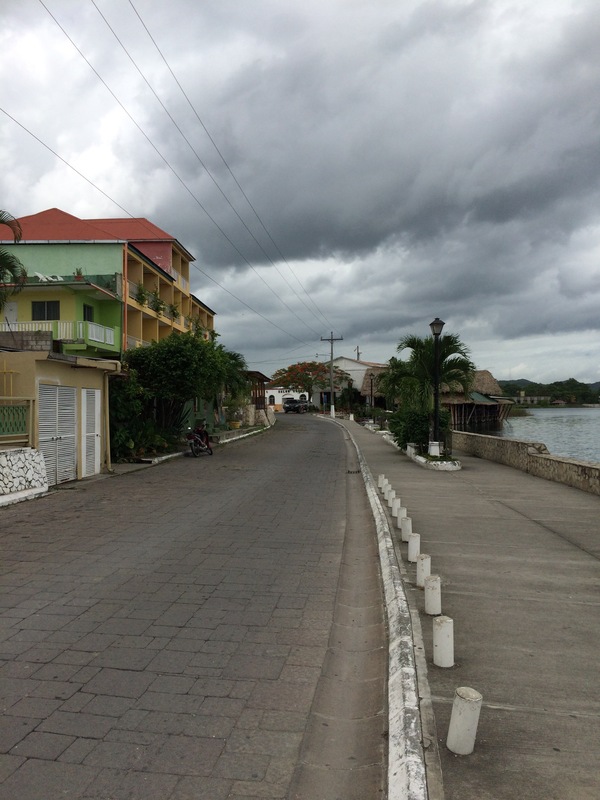 We were taken on a tour of Santa Elena, our town, and San Ignacio, the town across the river, in our first few days. 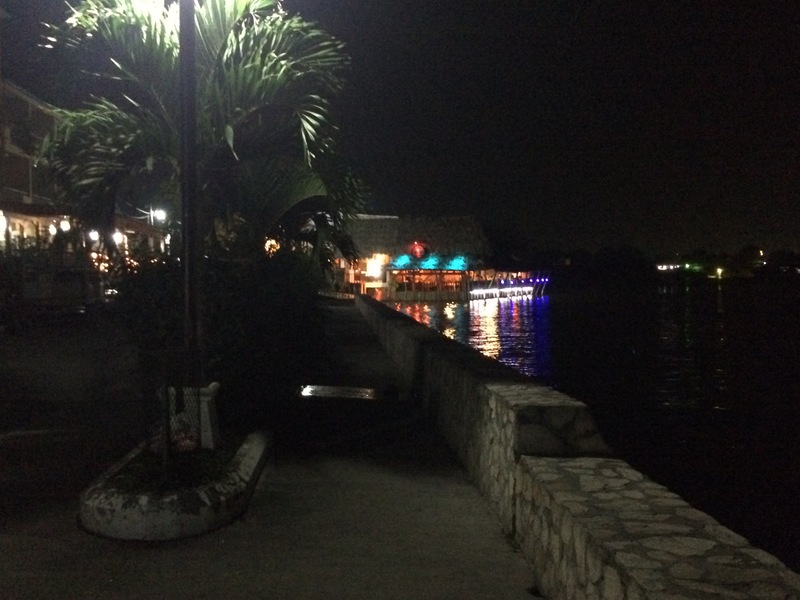 A small bridge connects the two towns one way, and the only suspension bridge in Belize connects the other side for the opposite flow of traffic. 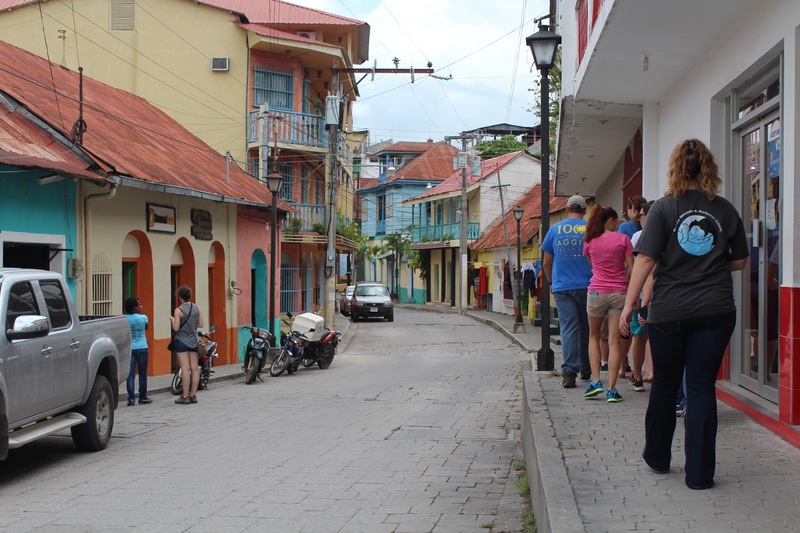 We spent a good amount of time roaming the market in San Ignacio trying out different fruits and shopping around for souvenirs. The fruit selection in Belize is incredible. Half of them I can’t pronounce and the other half are ones that I’ve never been exposed to, like starfruit. Along with that, fresh juices are the thing around here, like sour sap, lime, papaya, and even watermelon. They’re delicious and refreshing and very sweet, like most things in this country. 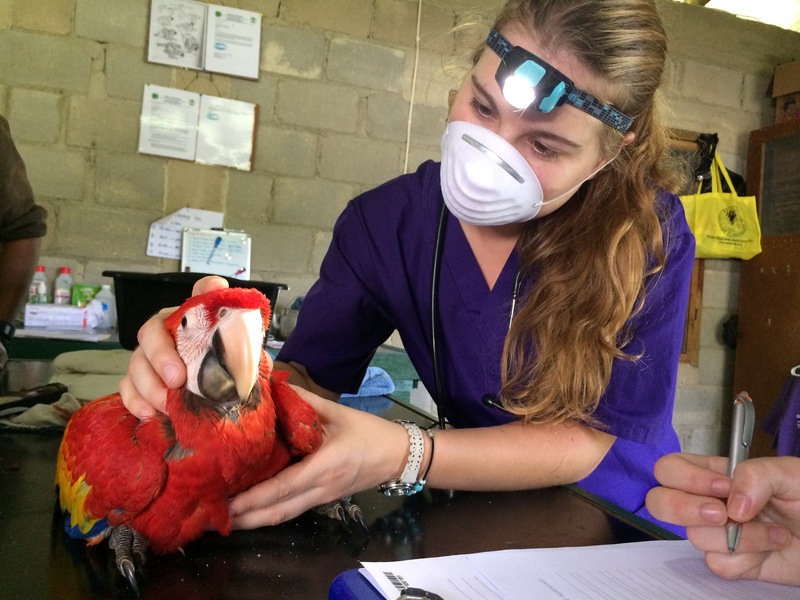 Dr. Isabelle and her husband Justin co-founded the Belize Wildlife and Referral Clinic, which is where I’ll be working for the next 4 weeks. I’m incredibly impressed with the work that has been put in to raising money, bringing in volunteers, keeping the center running, and honestly just creating the clinic in the first place. 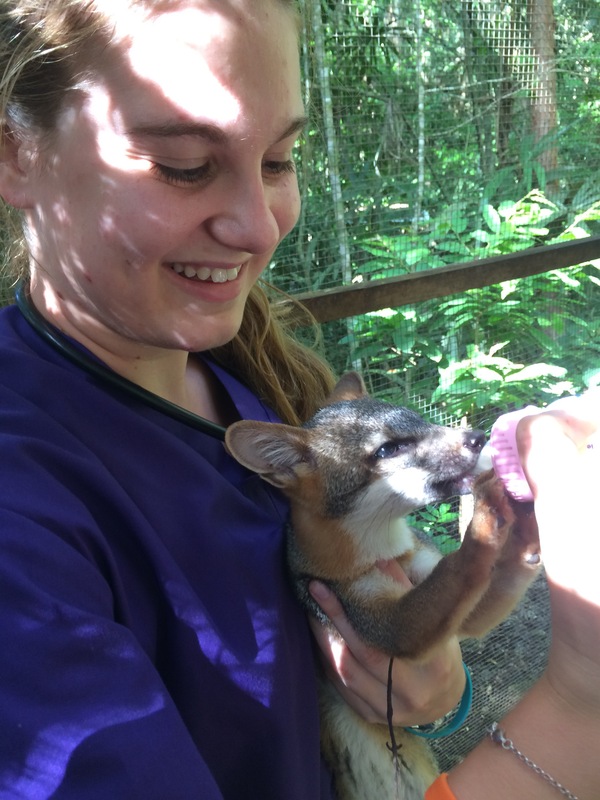 It was a difficult road with little funding and a lot of potential for failure, but as a country with about 25 veterinarians, Dr. Isabelle felt the country needed more veterinary medicine and a place that wildlife can be brought in, so that’s exactly what she provided. That kind of determination and later success keeps me motivated to fulfill my own goals. 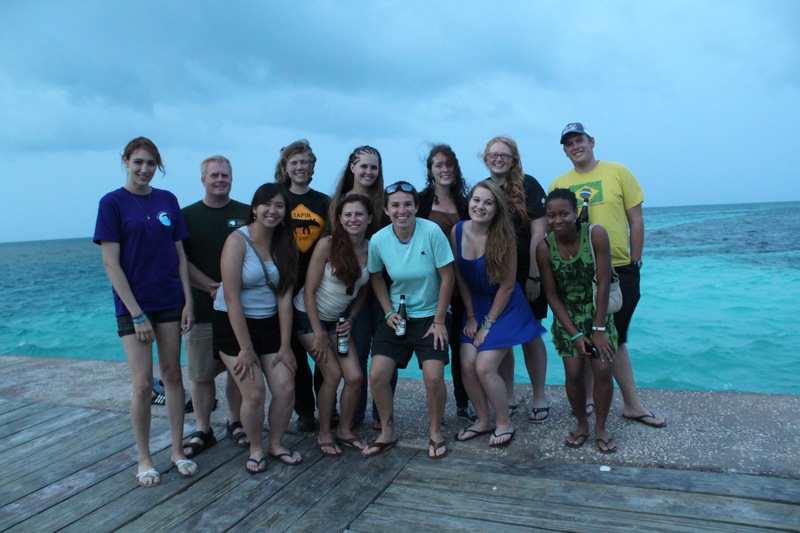 The first day at the clinic, she taught us a little about conservation and main issues with conservation in Belize. 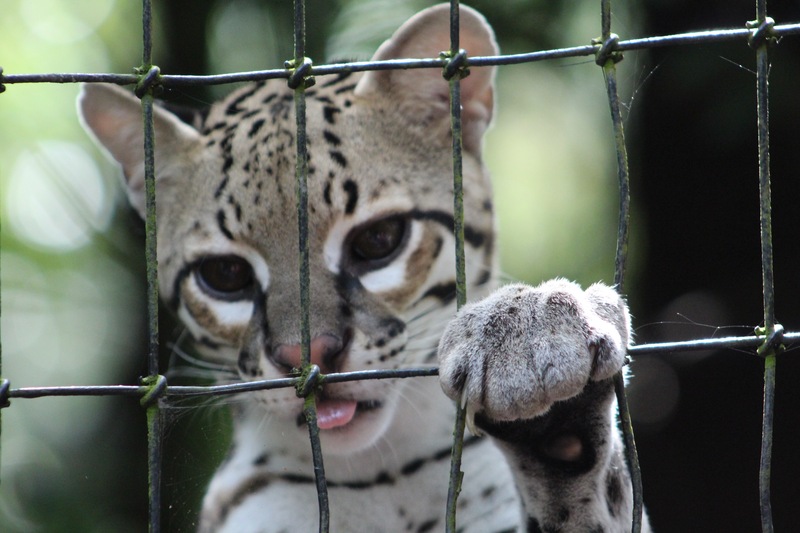 A large problem is illegal animal trade and the conditions animals are kept in while in transport/storage. We learned about cases where BWRC obtained illegal pets that were confiscated from homes, especially from abused situations. A lot of these animals suffer an immeasurable amount of stress and the stress causes them more illness. 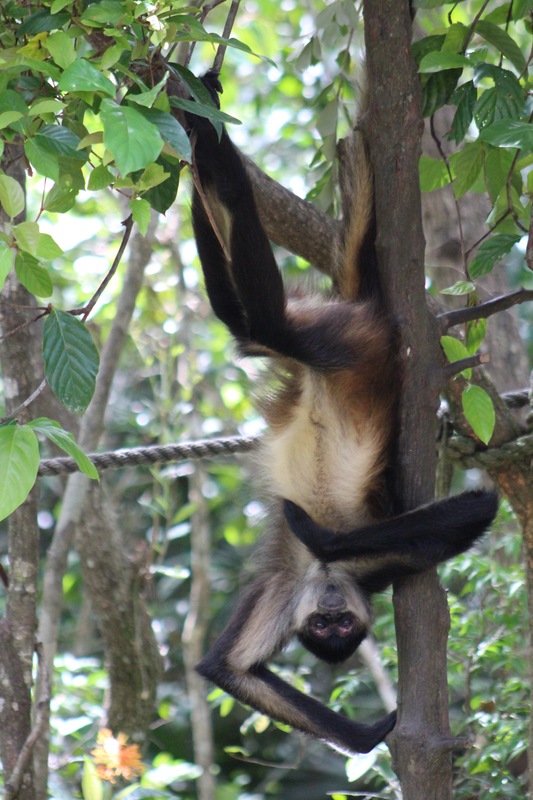 A stressed animal can suffer from something called capture myopathy, or great stress during capture/captivity. Worst case scenario: death. 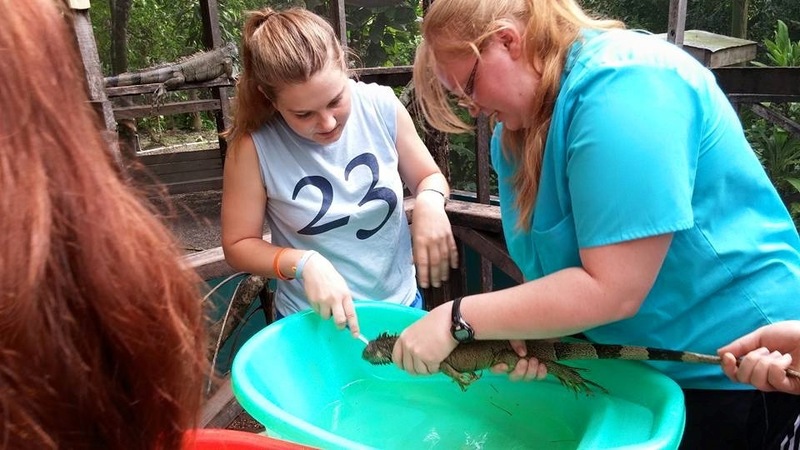 Wildlife vets and conservationists do their job as quickly and with as little stress as possible so that wildlife does not get used to humans, feels as little discomfort as possible, and once healthy, can go back into its natural habitat quickly. 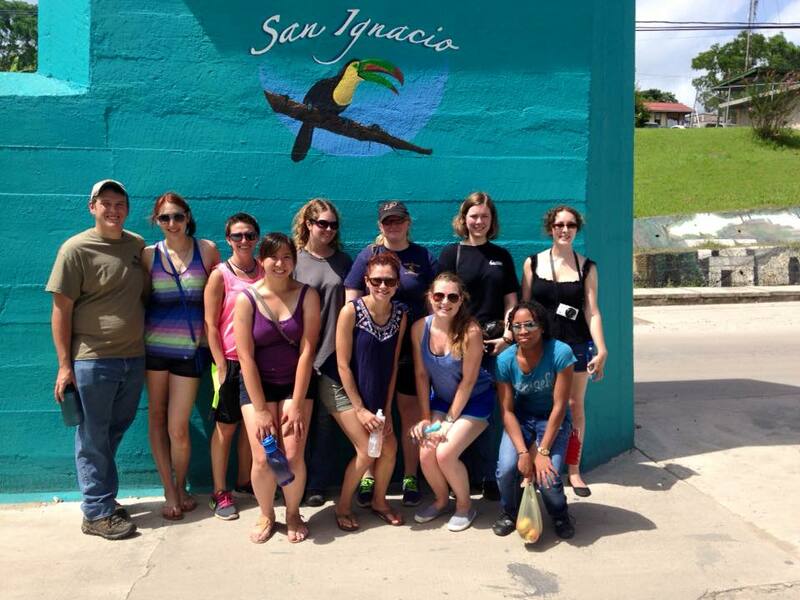 Soon after, we visited the Green Iguana Project, which is a conservation project behind the San Ignacio Hotel. 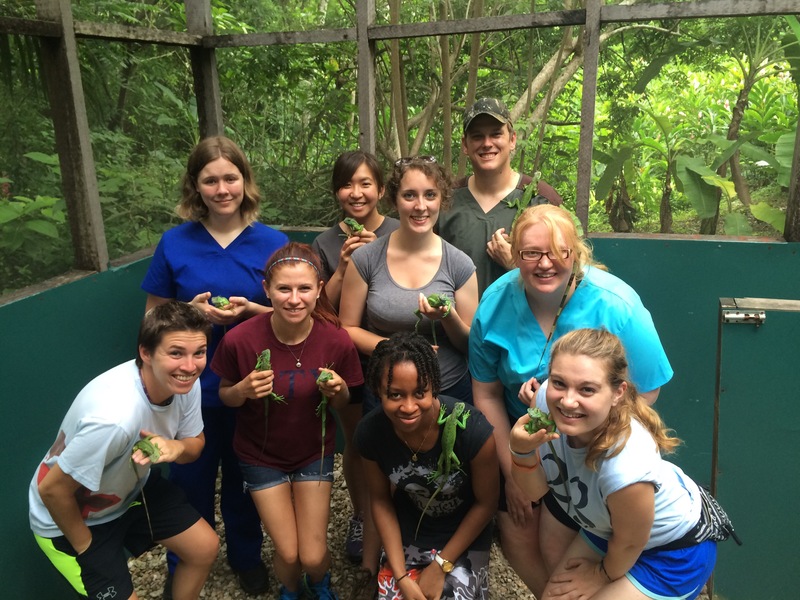 We were called in to catch, restrain, hold, and wash iguanas of ticks, mites, and old skin. 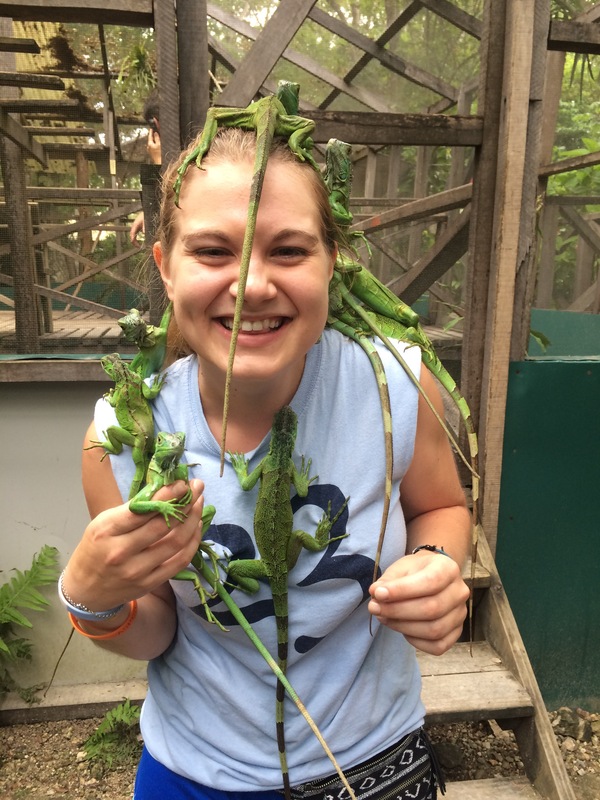 We were taught how to hold an iguana, and I have to say, they’re a lot stronger than they look. Their tail is like a whip when it strikes your skin; their claws are sharp enough to draw blood, and their bites, well… we were told that we do NOT want to get bitten. Message received. After they were caught, one person held while another scrubbed them with a toothbrush and iodide solution. A few dozen iguanas later, we were finished and got away with no bites! Some were super friendly too. 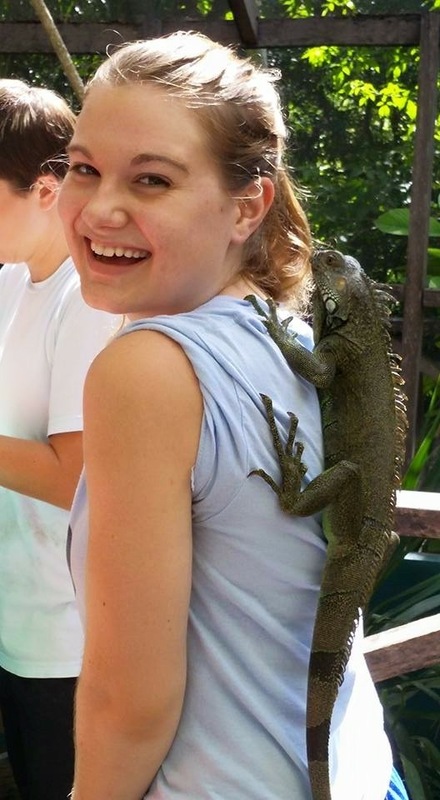 I had one on my back that was just hanging out for a while with no intention of getting off. We also got to see the babies and took turns putting about 12 or so on ourselves for a photo. They’re a lot more ticklish than I expected, and the babies were still small enough that we had a lot easier time holding them. 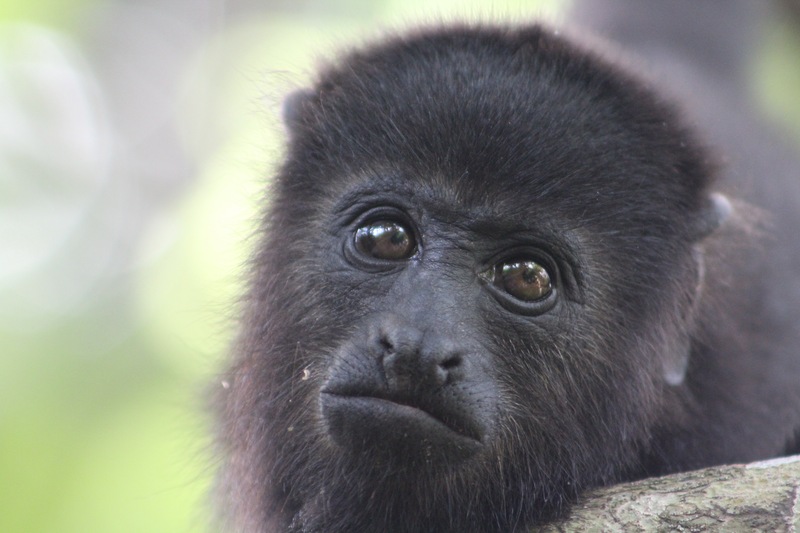 Since we’ve been here, we’ve also gotten to see an emergency surgery done on a baby howler monkey. A dog had bitten her tail and the vertebrae were no longer fused together. 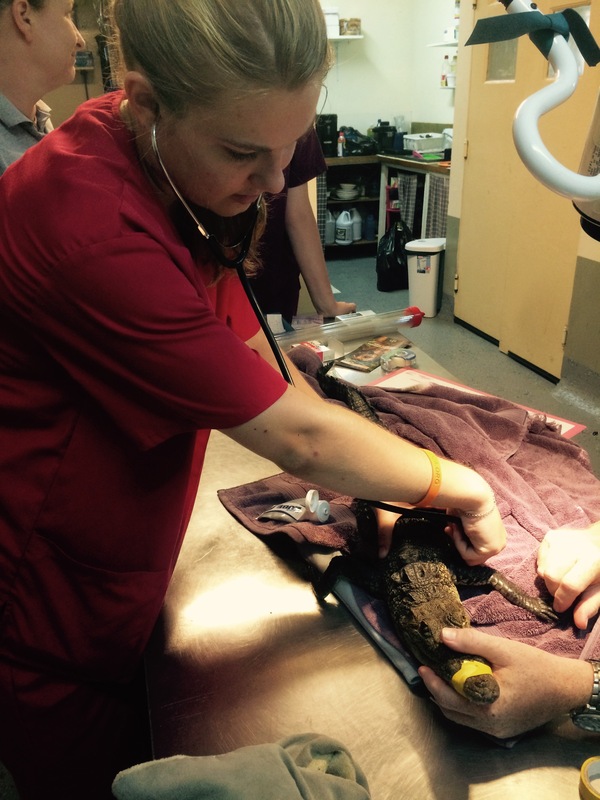 It took a few hours but Dr. Isabelle managed to sew the tail back up and put a splint to hold it in place. 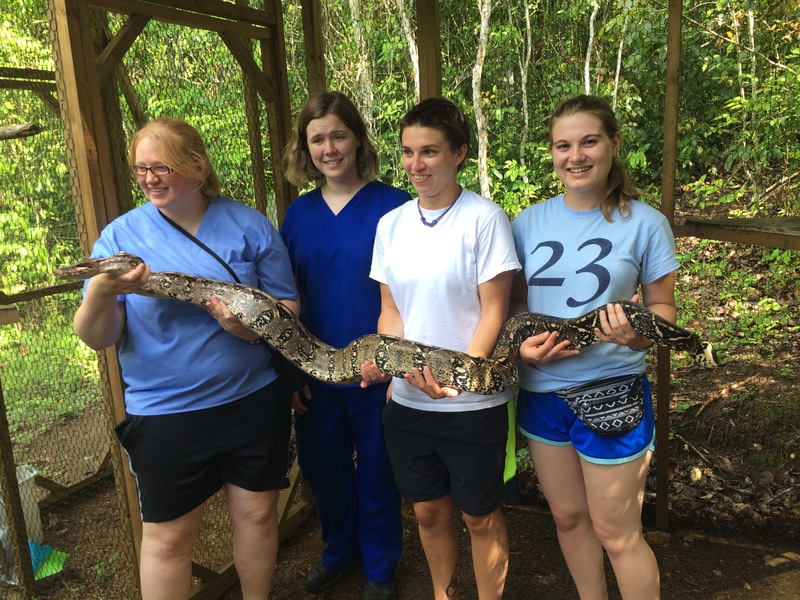 In the meantime, some of us got to go to a different part of the reserve to see BWRC’s other patients. 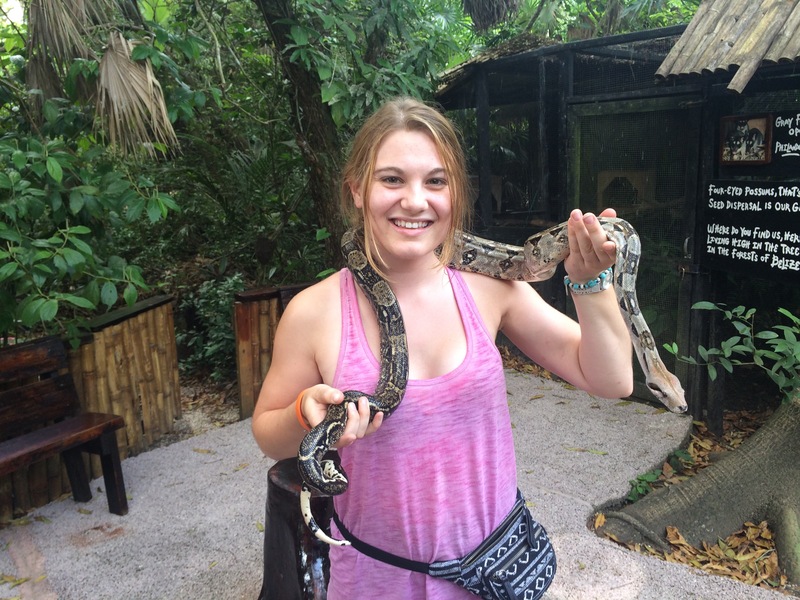 There was a baby fox, a gibbet, some peccaries, and a boa constrictor. The boa was not eating on its own yet, so there were live chicks in its enclosure to encourage some sort of appetite. We got to hold it (my first time holding a snake) and give it “physical therapy” (basically annoy it enough to move around on tree branches). So many cool opportunities and such a beautiful country to be in.